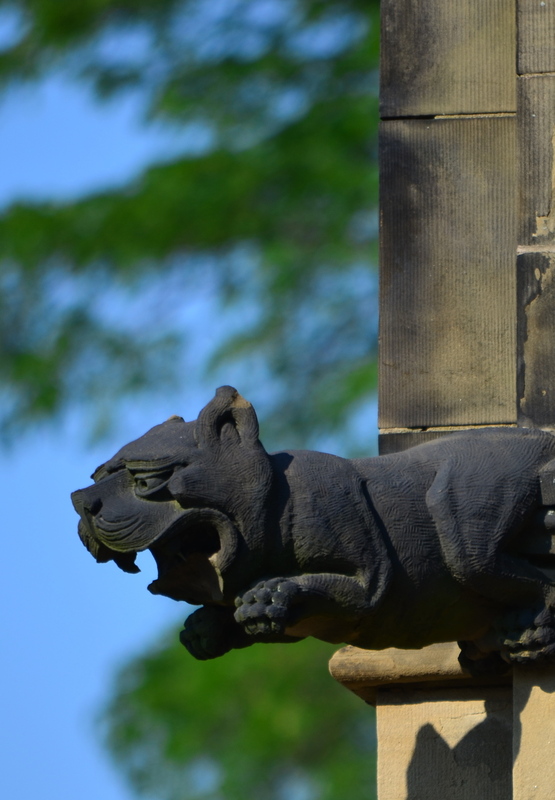 The feline grotesque protecting the northwest corner of the narthex has gone jaw-less and borne a docked ear for many years. We say, "feline" for the artist caring for him–or her– has used images of large cats to fashion the replacement mandible. 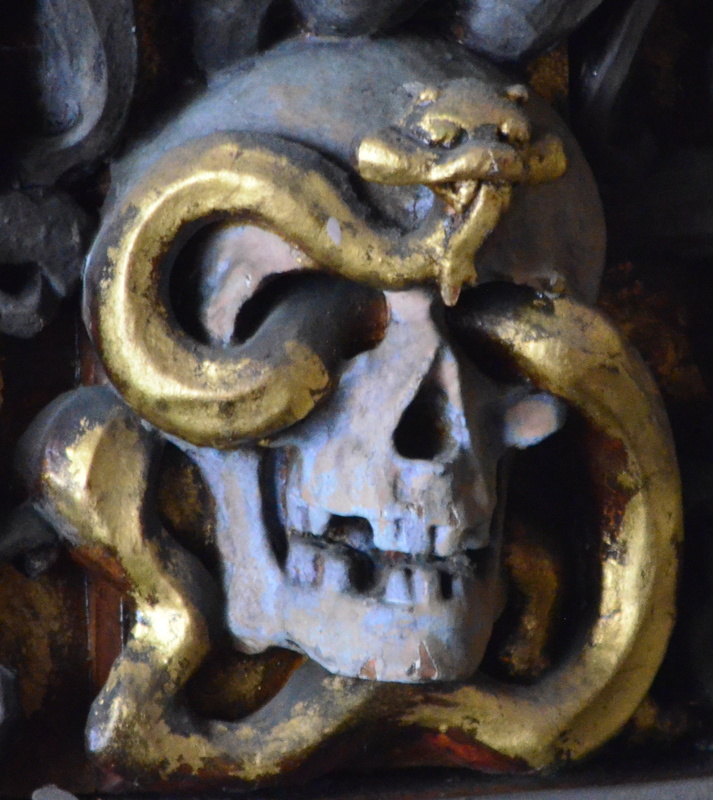 The jaw had apparently fallen off once before and been caulked back into place, perhaps by well-meaning gentlemen of the parish. When it fell the second time it was lost to the parish, perhaps buried in mulch or carried off. As part of this restoration project she–or he–will get a replacement jaw fashioned from similar limestone. And, an ear-tip in the bargain. 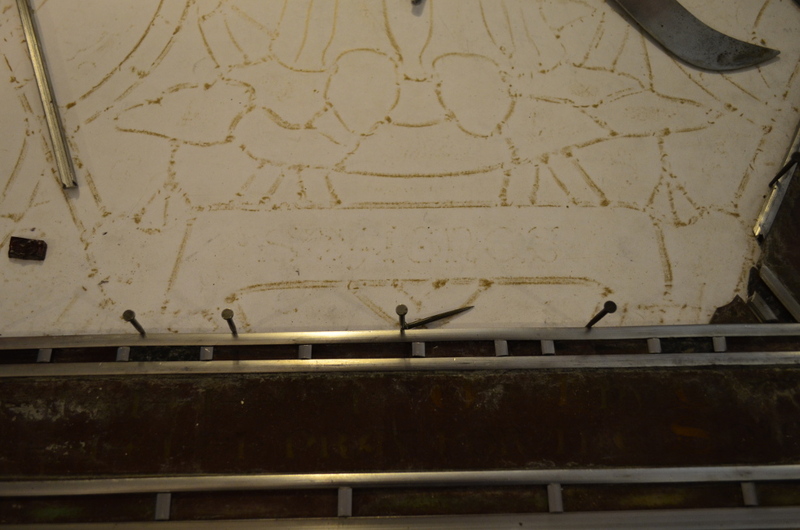 This work is by the same craftsman who is repairing the spawled stone at the foot of the high altar reredos. 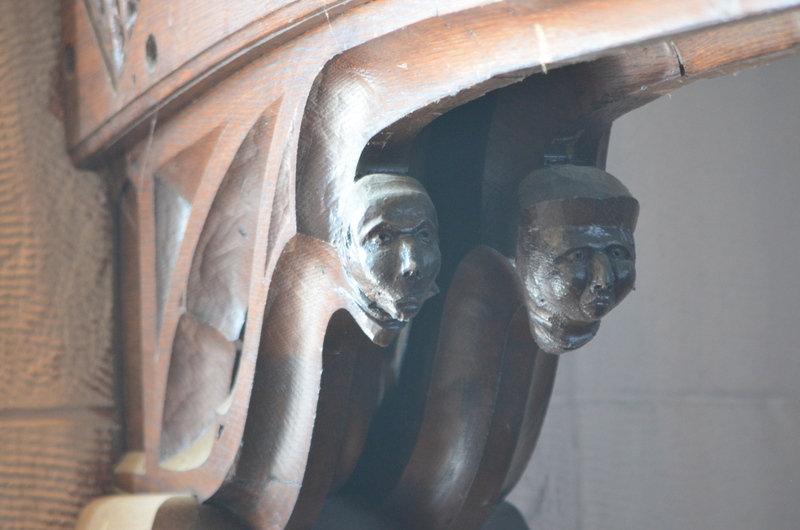 See here and here for more photographs of the two grotesques warding evil from the church's main door. Masons and bricklayers, roofers, steelworkers, carpenters–finish and framing–millwork contractors, piper fitters and plumbers, wood and stone restoration contractors, electricians, paint strippers and painters, plasterers, organ builders, lighting consultants, stained glass window restorers, lighting restoration experts, security and elevator contractors, heavy equipment operators, asphalt contractors, landscapers, together with the laborers experienced in each of these trade, door hardware consultants, MEP engineers, project managers, engineers, and superintendents, architects and the building committee. 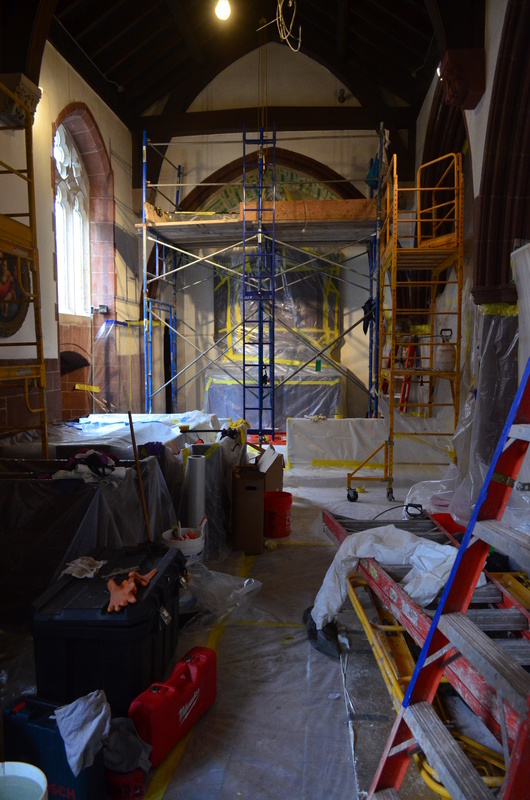 Each of these–as many as 60 workers each day—has been working diligently on the All Saints' restoration during the month of September. Silhouette of trees in the dawn sun against the east face of the bell tower. 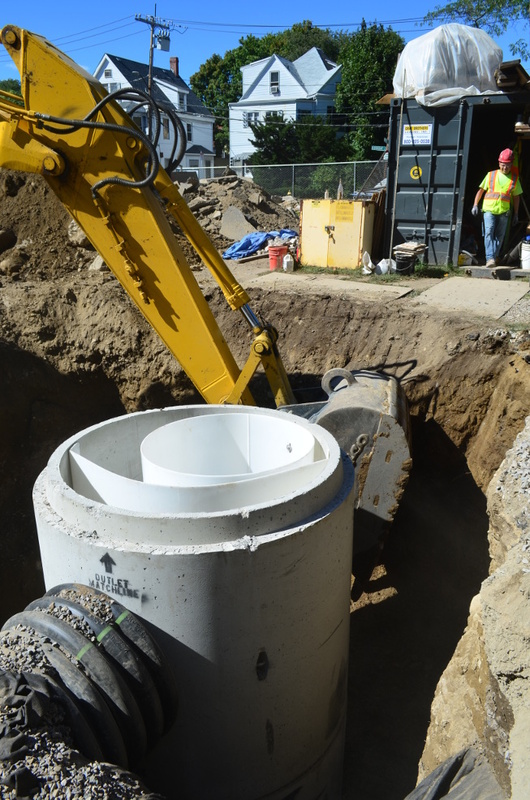 The dim yellow motor housing of an excavator can be seen on the right adjacent to the dug-up asphalt parking lot surface. The work site will be quiet for another half-hour. Click on any photograph to see it larger. Two o'clock in the afternoon the previous day, a oil and sediment separator is set. The plastic guides inside this structure channel parking lot storm water in a circular path to remove automotive contaminates and sand from parking lot run-off, before the water enters the retention structures to recharge the site's ground water. The bell tower in early-morning light in the background, with a roofer and two sheet-metal workers in the mid-ground and the three-sash window in the south elevation of the reconfigured stair hall. A portion of the stair to the cloister attic and organ chamber can be seen through the window. Rain falling at the ridge of the addition will travel toward the viewer across (according to roof pitch) yet-to-be-installed slate, flat-seam copper, slate, and flat-seam copper before entering a gutter at the roof line in the immediate foreground. The scaffold-shrouded addition between the parish house and the Lady Chapel. 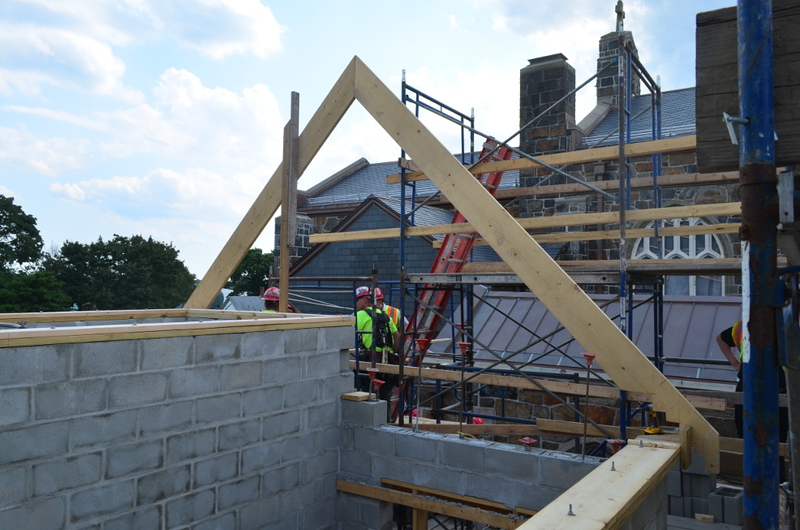 The addition and vestibule will be finished to match the parish house: brick at the first floor and weather vestiblue and half-timbering and stucco at the second floor. Click on the photograph to see a closer view. A close-up of the weather vestibule on the left. The brick of the addition has been carefully sourced, cut, and laid to match the original 1912 brick of the parish house. At the right, the sandstone window surround at the west elevation of the addition has been salvaged from a removed parish house window. The the holes in the stone, by which an old security grating was attached, will be repaired. New sandstone for the two-over-three sash window at the north elevation has been cut and tooled to match. Visible against the sky atop the entrance to the Lady Chapel in a previous photograph, this image of the Lady Chapel roof cross was taken facing roughly north from the scaffolding around the addition. Click on the photograph to see the cross in context. The Lady Chapel in temporary disarray. The photograph on the left faces project south toward the securely wrapped John Kirchmayer reredos. See here for pre-project views of the Lady Chapel. The principal work entails stripping the 1950s-era paint from the red Lake Superior sandstone at throughout the room. 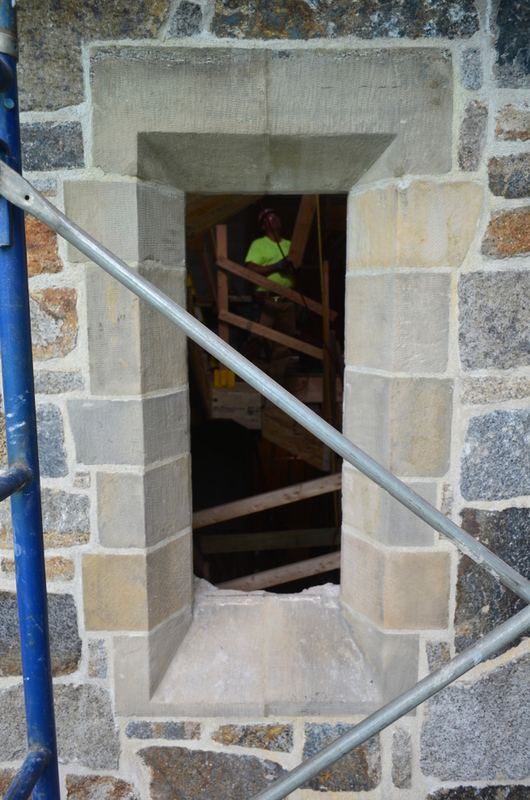 Repairs are also being made to the stone tracery prior to the reinstallation of the three Vaughn O'Neill "Mary Windows." The photograph on the right faces project north and suggests the full extent of the stone stripping. Additionally, this room will receive sprinkler and fire alarm protection to bring the space up to code. Together with the rest of the church, the historic lighting fixtures in the Lady Chapel have been restored, but not yet installed. On the left is a view looking up at the stripped stone arches of the Lady Chapel, and beyond, of the arches of the church nave. 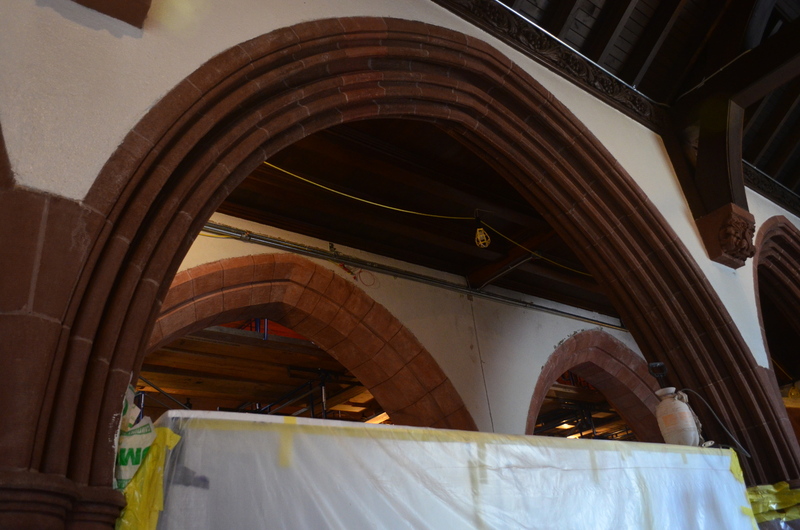 In this photograph, the arches have yet to receive their final neutralization wash to remove the remaining whitish efflorescence. 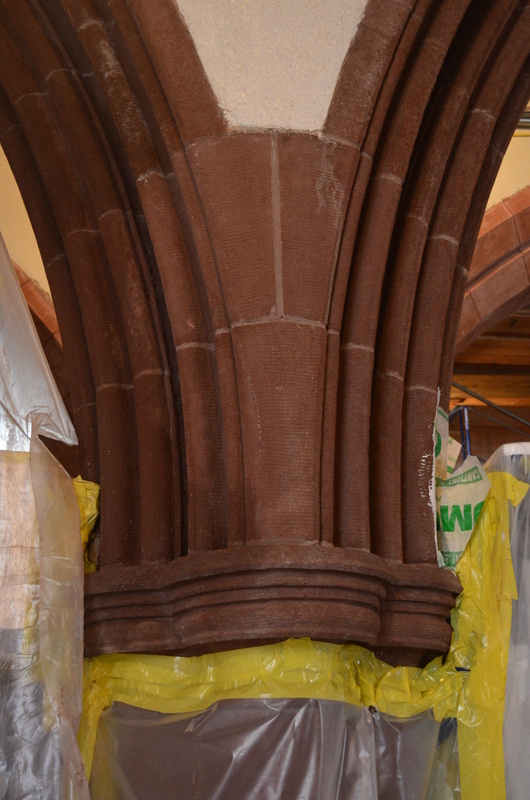 At the top in the chapel, notice the stripped corbel supporting the truss-work as well as the band of woodcarving just beneath the unpainted electrical conduit. The parclose screen separating the chapel from the aisle is wrapped in white protective sheeting. On the right, yellow Baker staging set in front of the central window at the project east elevation of the Lady Chapel. 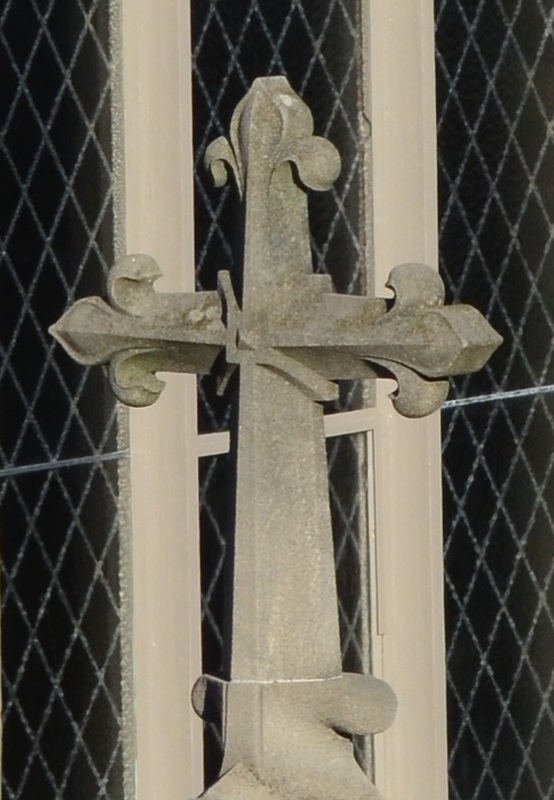 It is into this tracery that Vaugh O'Neill's window "Coronation of the Queen of Heaven" will be set. These windows were provided in the 1970s with loose-fitting Lexan sheets to protect these windows from vandalism. In this current restoration, the tracery rabbet has been adapted for exterior protective glazing, vented to the interior. Notice the unstripped corbels. A detail view of the partially stripped, fluted arches in the Lady Chapel springing from a wrapped pier. 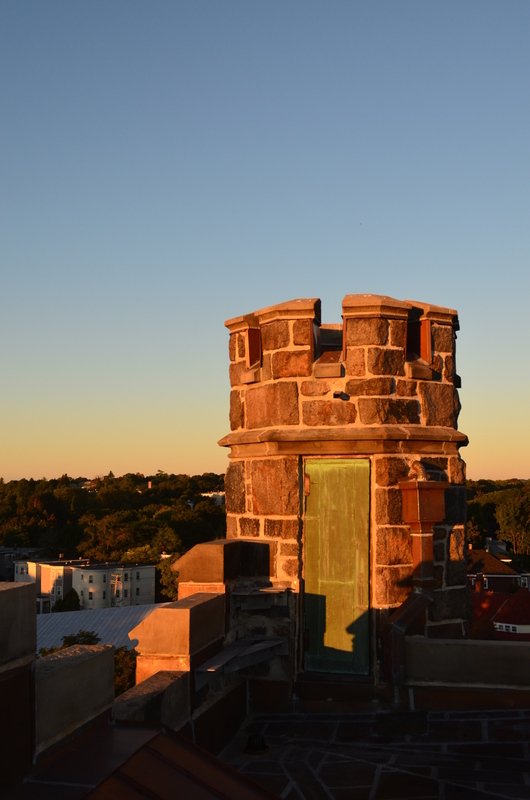 A late-September dawn breaks on the old copper-clad door into the stair of the bell tower. Notice the galvanized seismic bracing of the parapet wall to the left of the door. See here for more photographs of work on the bell tower roof. 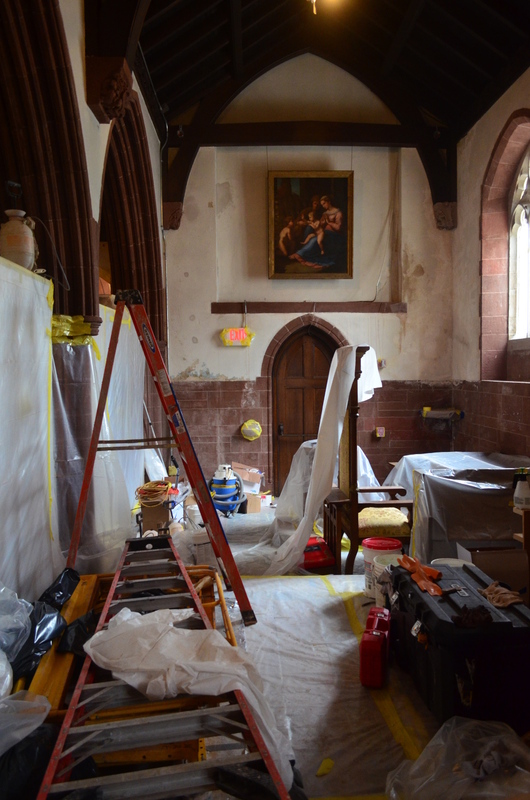 A principal focus of the current restoration work is the reconfiguration of the stair hall connecting the three floors of the parish house to the two principal floors of the church and cloister hall. 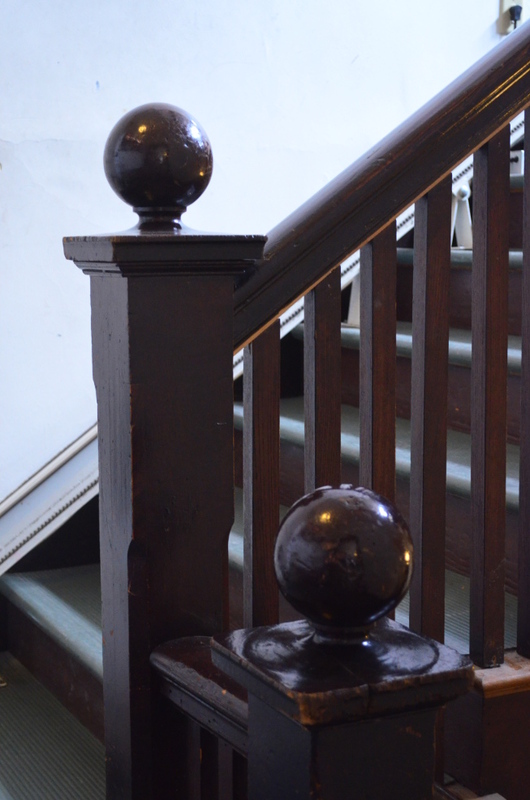 A history of the stair hall with photos can be found here and here. 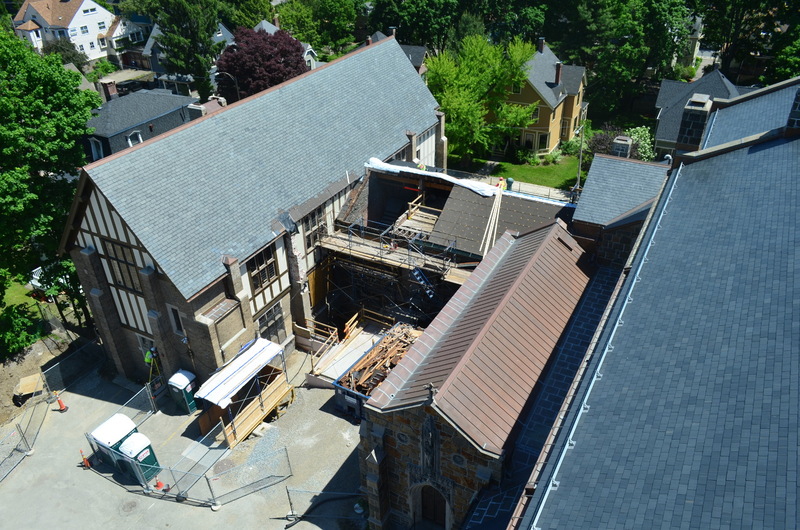 This photograph shows the location of the new addition to the parish house, in the ell between the granite wing on the right (called the cloister hall by generations of parishioners) and the brick and half-timbered/stucco parish house at the top of the photograph. The addition will be approximately 20' by 17' and will extend east to encompass the brick buttress between the two windows. Click on any photograph to make it larger. 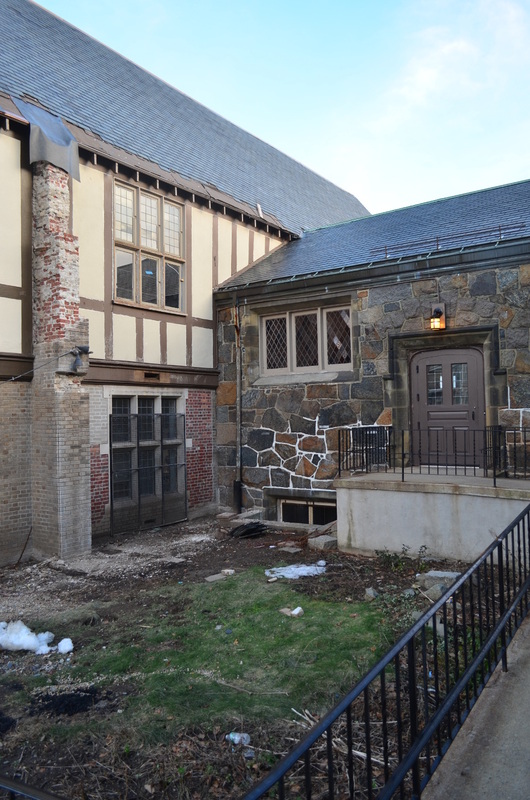 This addition will house a two-door, five-stop elevator, a chair-lift to the gymnasium, a family bathroom off of Peabody Hall, elevator lobbies at the Guild Hall and Peabody Hall levels of the parish house, and several storage closets. In addition it will house a short stair from the entrance lobby of the parish house to the cloister hall of the church. The addition will have a small weather vestibule on its north side. 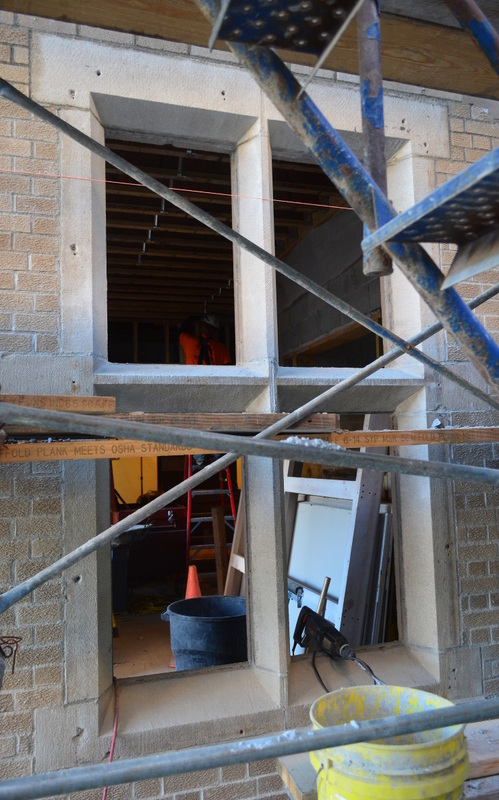 Both the first and second floor parish house windows have been salvaged and will be replaced with entryways from entrance and elevator lobbies to the parish house. 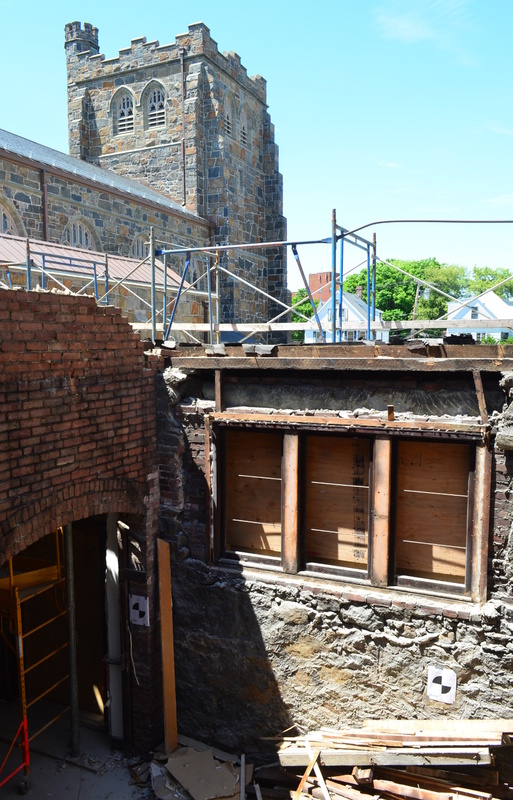 The three-sash window at the church level of the cloister and the two-sash window in the basement level have been demoed to make passage from the entrance lobby and basement elevator lobby to the newly constructed stair hall. 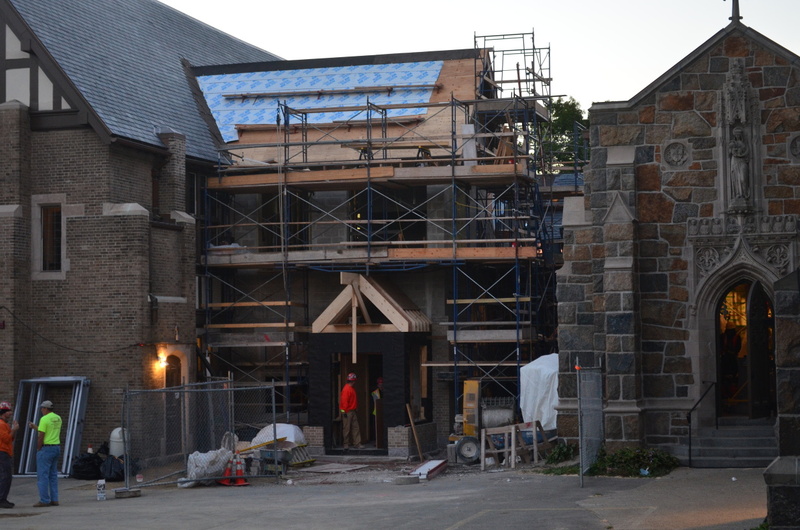 The elevator door to the cloister hall will be approximately at the location of the door at the head of the (now demoed) 1980s handicap ramp. 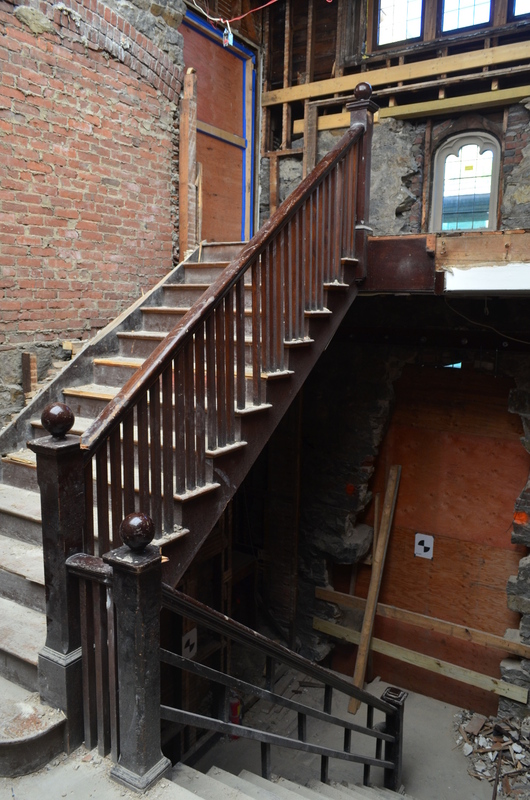 These two photos depict the old stair hall. The photo on the left was taken facing north from the threshold of the Lombard Street door. It clearly demonstrates how generations of parishioners were made to descend from the first floor Guild Hall to an intermediate landing before they could ascend to the church and Peabody Hall. The white door in the middle gave onto yet another stair down to the classrooms. The photo on the right was taken from the cloister hall facing roughly east and south. The stair in the middle of the photo goes up to Peabody Hall. See the 1990s-era stair climber attached at the bottom molding. The stair at the bottom-right of the photo goes down to the intermediate landing for the Lombard Street door, itself an eight-step stair above the exterior grade of Lombard Street. On the left, the two newel posts at the cloister hall landing. 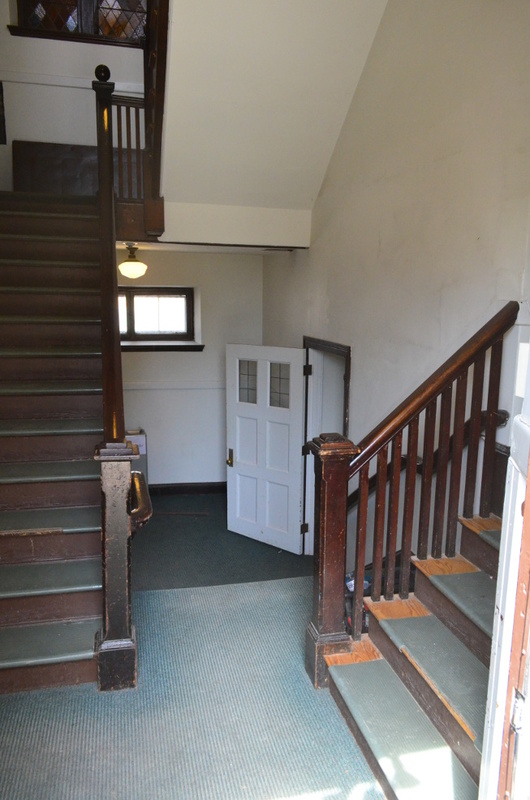 On the right, five steps up from the classroom level (at grade with Lombard Street) to a landing and on toward the choir room and men's room. The photo on the left was taken toward the south from the sub-basement level of the cloister wing. It shows evidence of the granite demolition done to lower the Lombard Street door to grade and to craft from salvaged limestone a new window at the Guild Hall level. The steel sandwich beam mid-way up the wall was temporary. The blocked off doors to the Guild Hall and Peabody Hall (sealed against construction dust with blue painter's tape) are just visible at the left margin of the photo. 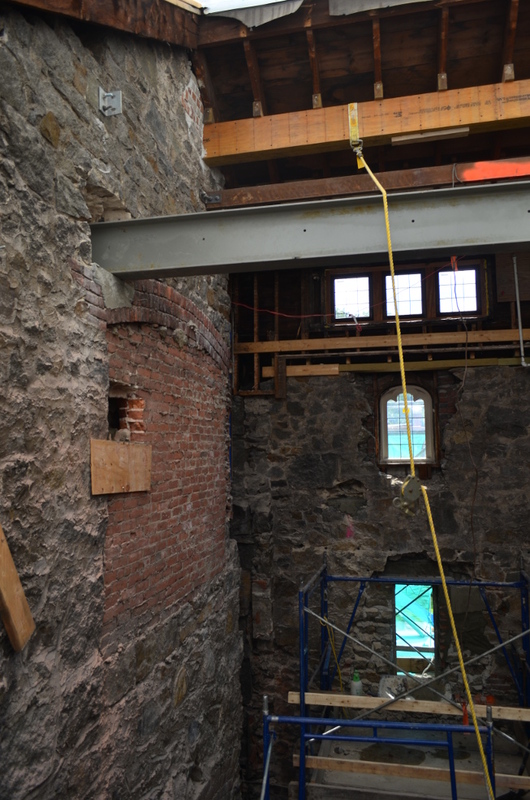 Taken two weeks later, the photo on the right shows three support beams spanning the stair hall void, two permanent and one temporary steel beam marked with orange paint. Visible on the left of the photo in the granite wall of the cloister wing is a bricked-in void, probably for a window. Both bricked in voids are visible in the photo on the left. On the left, the east wall of the stair hall taken from the sub-basement. The lower boarded up doorway is the Guild Hall and the one above that is for Peabody Hall. On the right, a view north showing the concrete masonry elevator shaft. 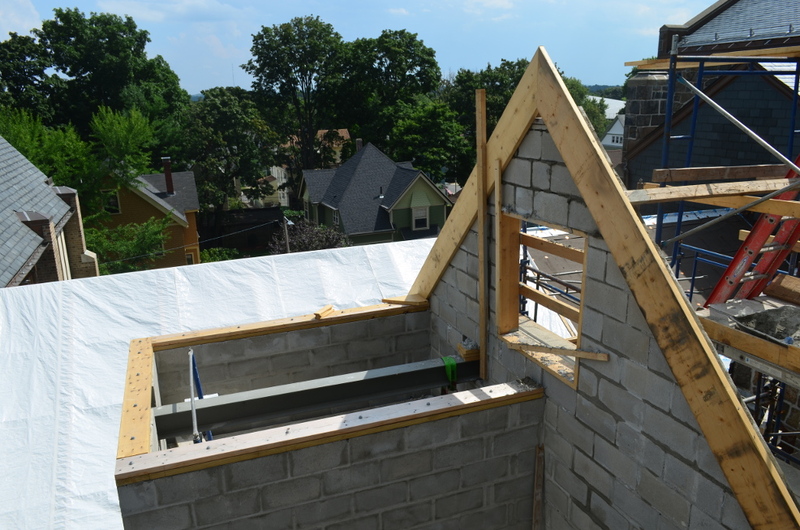 The framed gable end of the addition, with the completed masonry one week later. A white tarpaulin covers the open rafters of the east end of the cloister roof beyond and to the left of the elevator shaft. 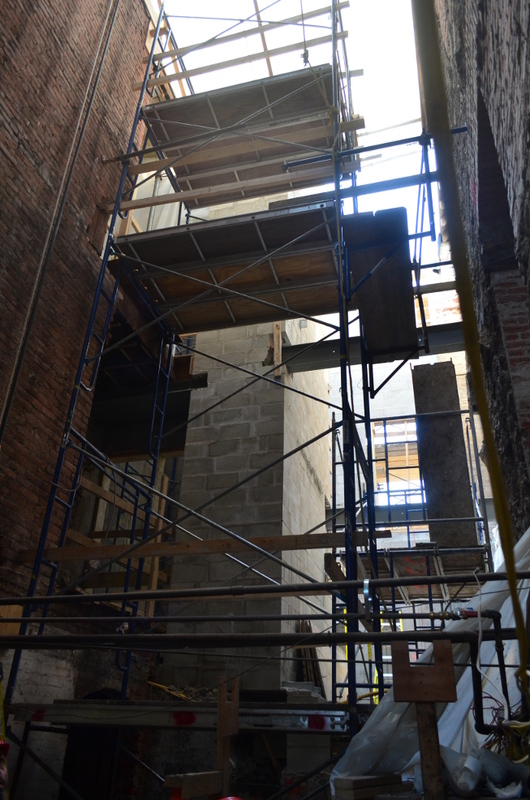 Taken from staging in the stair hall void, a large two-over-three sash window will be placed in the opening in the north wall of the partially framed second-floor elevator lobby. 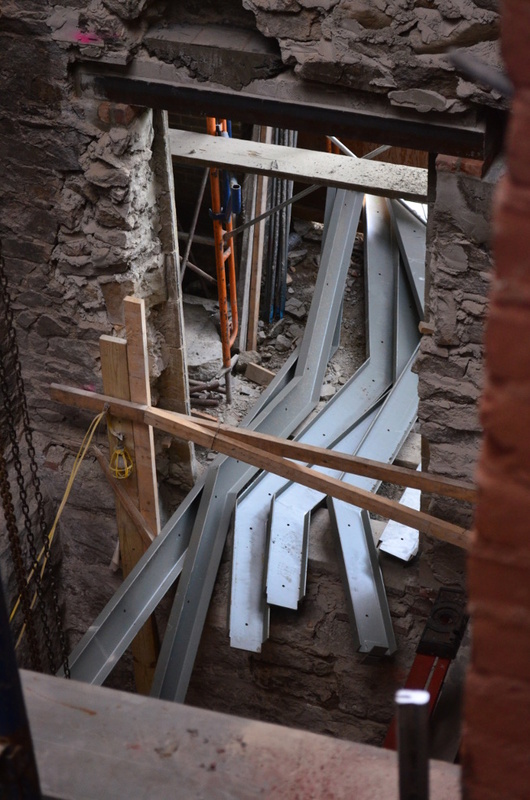 On the right, a pile of steel stringers poking through the Lombard Street doorway, ready for installation. The ridge beam and rafters rise above the scaffolding in this late August 2014 photo. The roof profile of the addition mirrors the roof profile of the small wing east of the parish house, which contains, in three floors, the nursery, the kitchen, and the Old Vestry. Click twice on the photo to enlarge it. Taken eleven days later from exterior scaffolding, facing north, the new window in the stair hall fashioned with salvaged limestone surround. 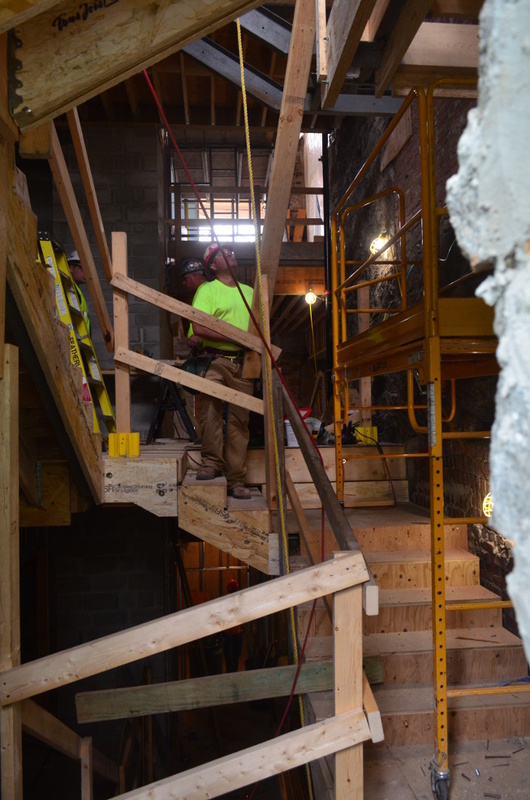 On the right, three more levels of the stair have been built, up to the unfinished landing at Peabody Hall. 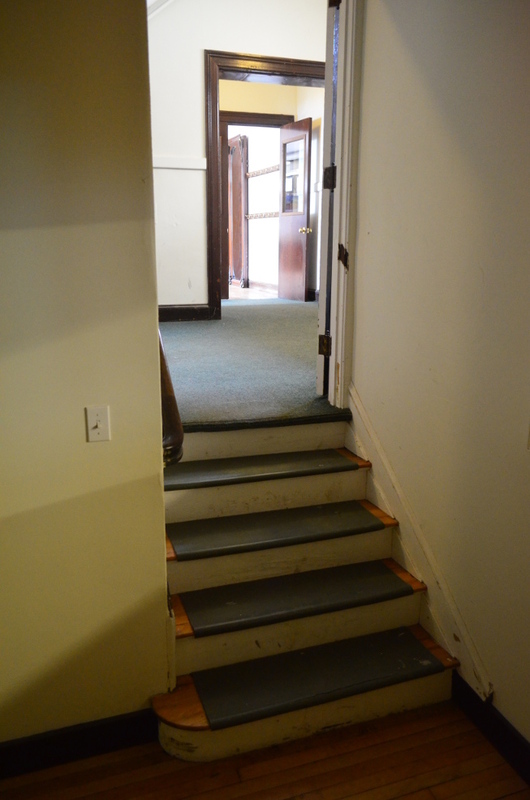 Taken facing south, this short stair goes from the entrance lobby of the parish house to the cloister hall. To the left at the base of this stair is the entrance to the offices and then to the Guild Hall. Out of the photo to the right is the north-facing elevator door. Up this stair and to the right will be the south-facing elevator door at the church level. 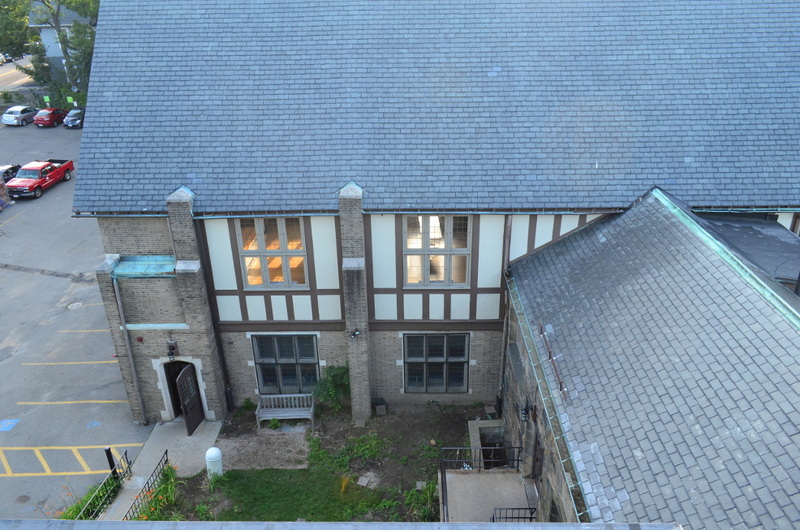 In the middle of the photograph, rising from right to left, is the flight up to Peabody Hall beneath two existing windows. This new stair hall runs counter-clockwise, while the old stair ran roughly clockwise. The reinstallation of the Christopher Whall window (1907) in the first bay of the nave began Tuesday, 23 September as the Lyn Hovey Studio's outside operations crew began carrying restored lancets and and tracery pieces up the interior scaffolding. 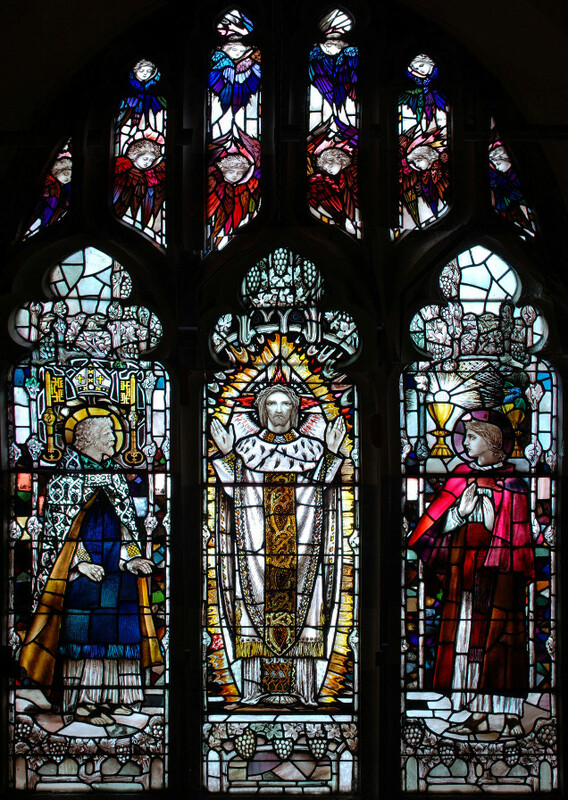 Depicting the Risen Christ with Saints Peter and John, this window is Whall's first American commission. Project window E209 has been completely restored for reinstallation. This transmitted light photograph was taken by consultant Julie L. Sloan before restoration. 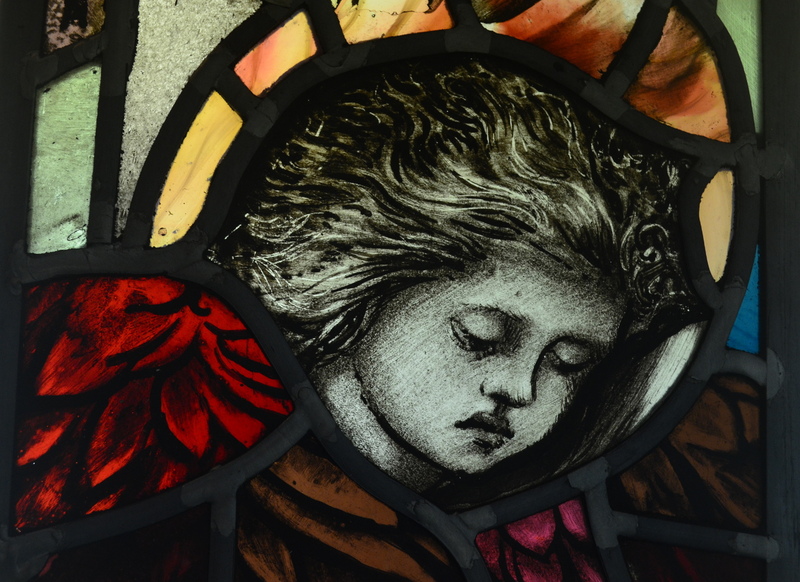 Detail of of restored Whall tracery (2) depicting one of ten angels adoring the resurrected Christ. This photograph was taken on a fluorescent light table. 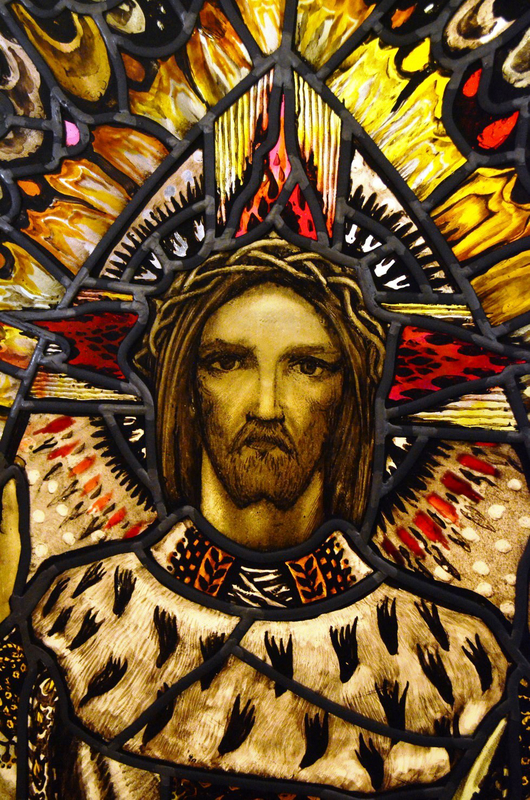 This photograph of Christ from the central lancet was taken with ad hoc compact fluorescent lighting: The color is not true to the window's appearance. With all the parts of the great west window back in place, both the quarry glass at the interior and the protective glazing on the outside, the great west window into the tower is nearing completion. Since All Saints' is not oriented, this window actually faces nearly due north. A workman from the Lyn Hovey Studio applies putty to seal the protective glazing at N206, in preparation for painting. Notice the new seam-face, Quincy granite, ADA-compliant ramp and walkway from the parking lot into the Ashmont Street door. 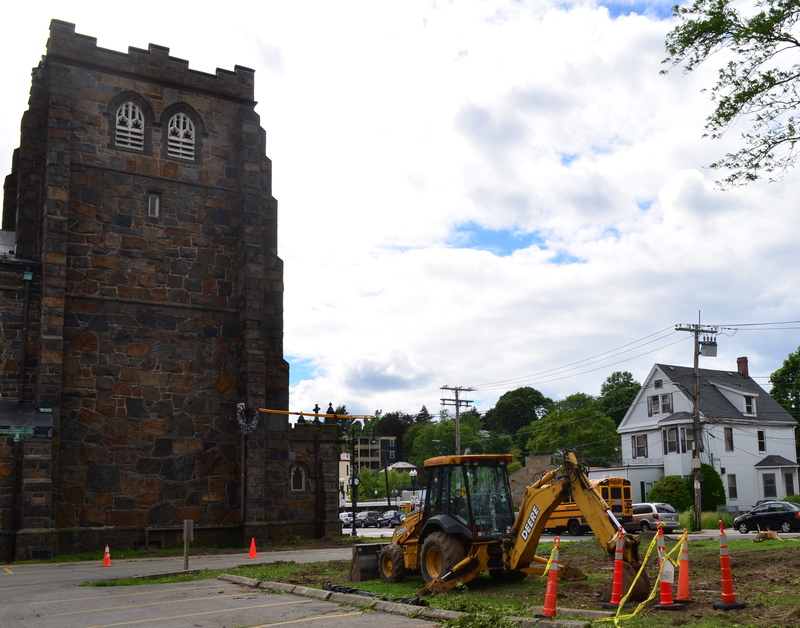 The careful, deep excavation at the juncture of the parish house with its connector to the church proper is complete. The concrete footings and beneath-grade walls for the elevator, wheelchair lift, the lobby, and the vestibule have been poured. 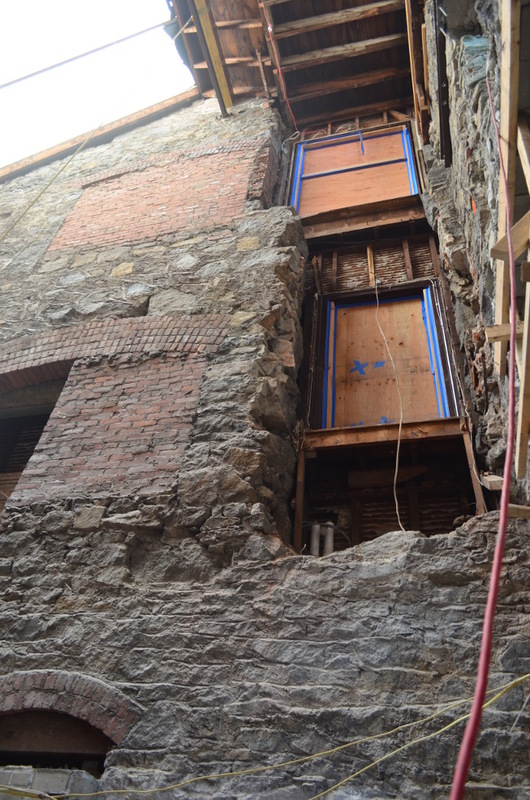 Now, the demolition of about 20 feet of original granite masonry wall, from roof line to basement level, is underway. 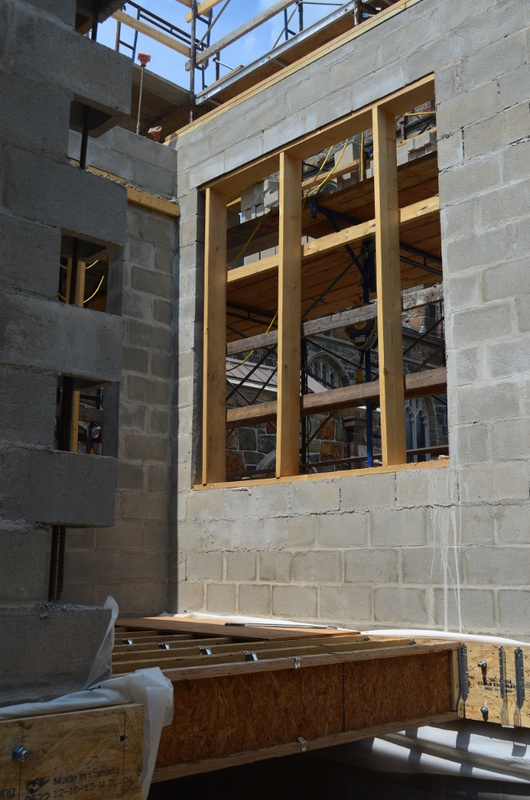 Next, the elevator shaft and the walls of the addition will be erected. 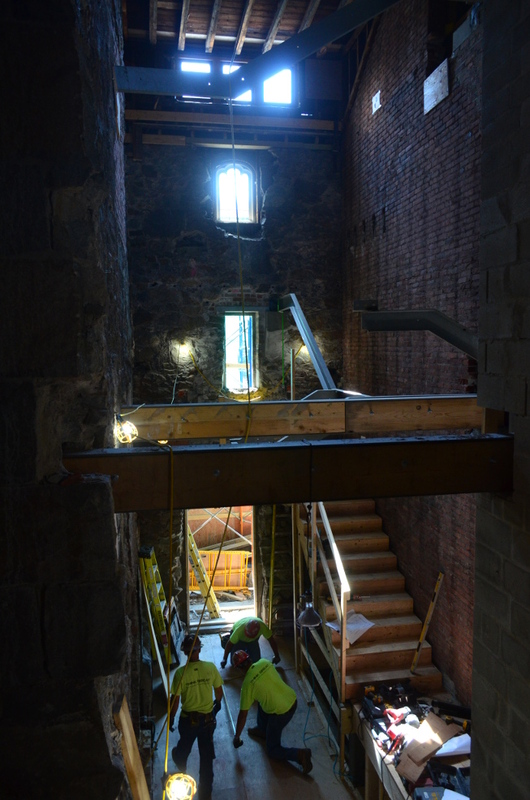 The bell tower, facing north from inside the old stair hall at the Peabody Hall landing. 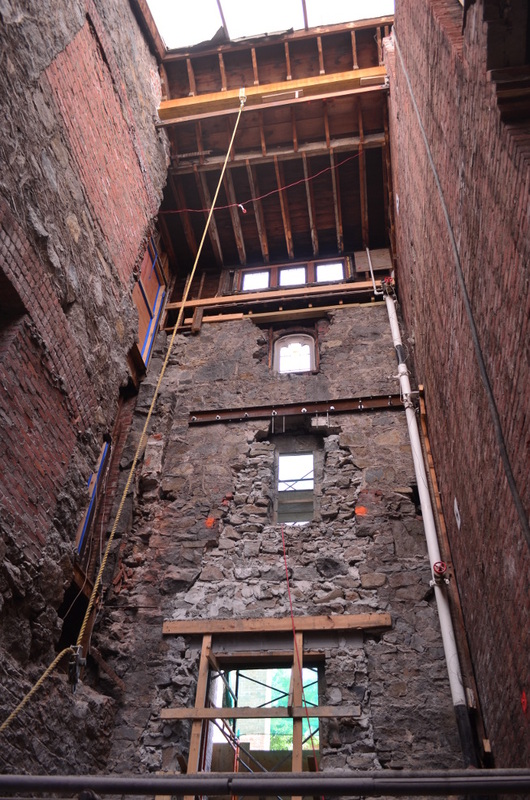 The three-sash window and the surrounding granite wall, together with the brick interior wall will be demoed to make way for a new fire stair and for access to a new five-stop elevator. As a first step, structural bracing has been put in place and a portion of the roof of the connector has been removed, together with the top landing and stair to the attic. Very quickly the rest of the north wall of the connector and the old stair hall, down to the basement level, will be demoed. 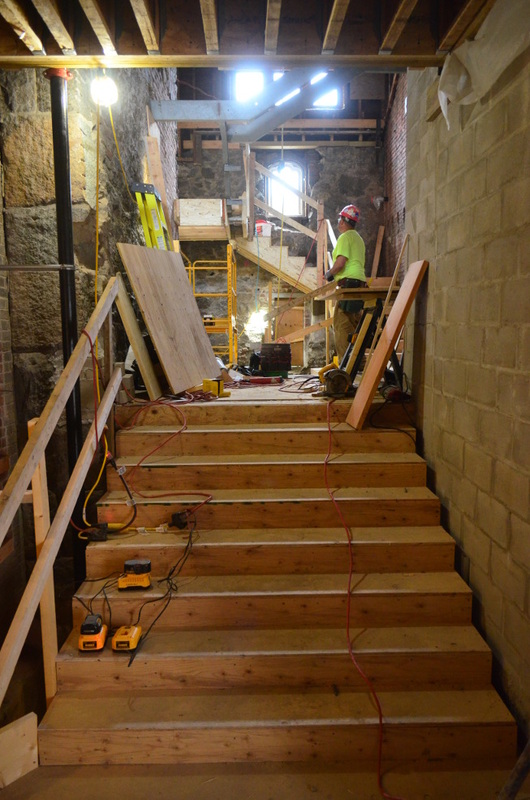 A new seven-step stair from the main level of the church to the first-floor offices of the parish house will be built through the opening created, as well as the two entrances from the connector into the elevator (lower level choir room & the main church level). Taken from the roof of the bell tower, this view shows the first day of demolition, with the roof and attic landing of the old stair hall removed. Click on any photograph to see it larger. 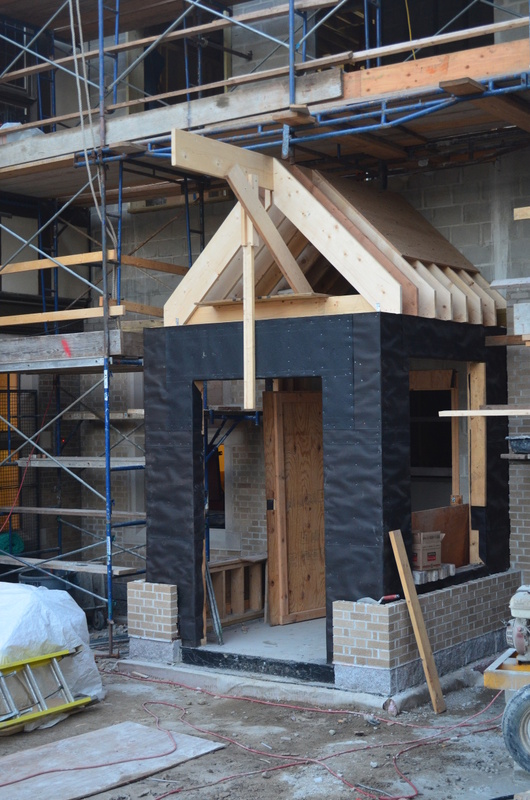 Outside the original footprint of the building, north of the connector, a two-story addition with vestibule will be constructed, faced in brick at the first story and with stucco at the second story to match the parish house. 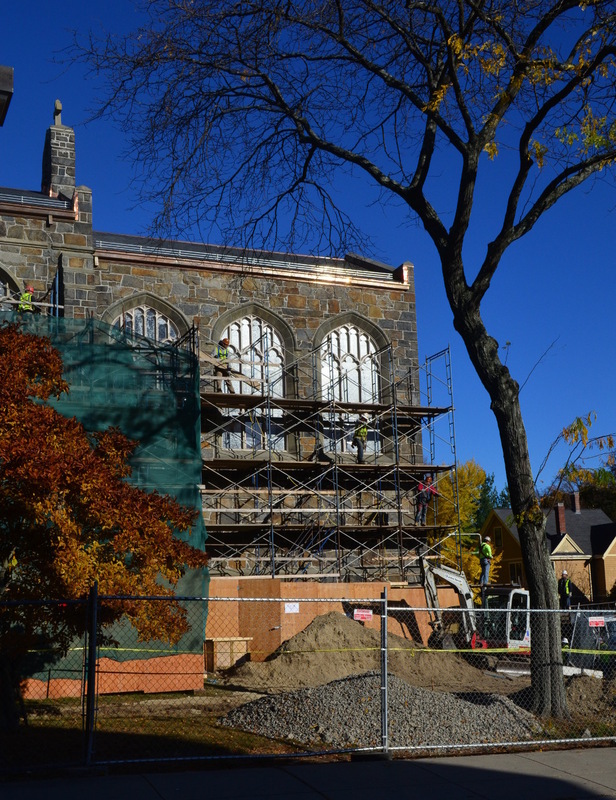 The addition will house the elevator with three lobbies for its north-facing doors, at the parish house basement, the first-floor Guild Hall, and the second-floor Peabody Hall. 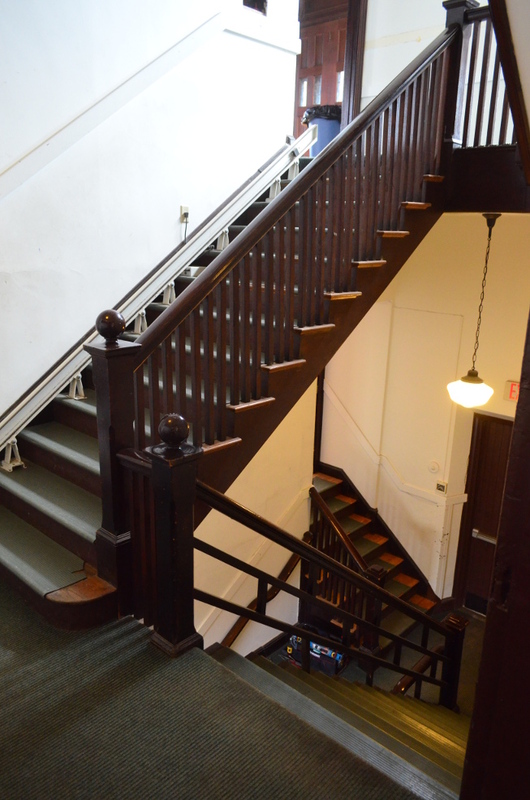 A view of the stairs up to the second floor landing at Peabody Hall. This stair will be gone on the second day of demolition. Notice the plywood-covered void in the south masonry wall. 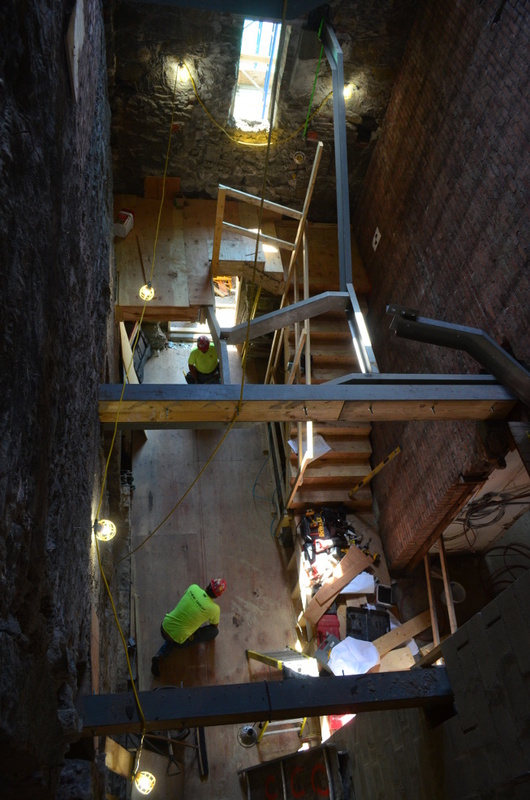 This shows the progress of the relocation of the Lombard Street door to grade, which will provide an accessible entrance to the basement level of the parish house, and by the elevator to the other public levels of the parish buildings. Carvers of wood and of stone sometimes seize their prerogative when their work is not subject to close inspection. Cathedrals are notorious for the bits of whimsy introduced high in lofty naves. Though on a much smaller scale, All Saints' is not immune. The rood before the nave and chancel were invaded by scaffolding. See here for more on the nave and chancel. At the great arch separating the nave from the chancel is a most solemn depiction of the central Christian fact of world history, the crucifixion. Affixed to the rood beam spanning the base of the arch, Angelo Lualdi's Christ is shown still nailed to the cross, yet triumphantly reigning. He is flanked by standing figures of the Blessed Virgin Mary and St. John, rapt in adoration. Jesus' pierced hands are attended by angels, above his head is a crown, and beneath his feet at the foot of the cross is Adam's skull. The green Tree of Life supports and surrounds the entire grouping. 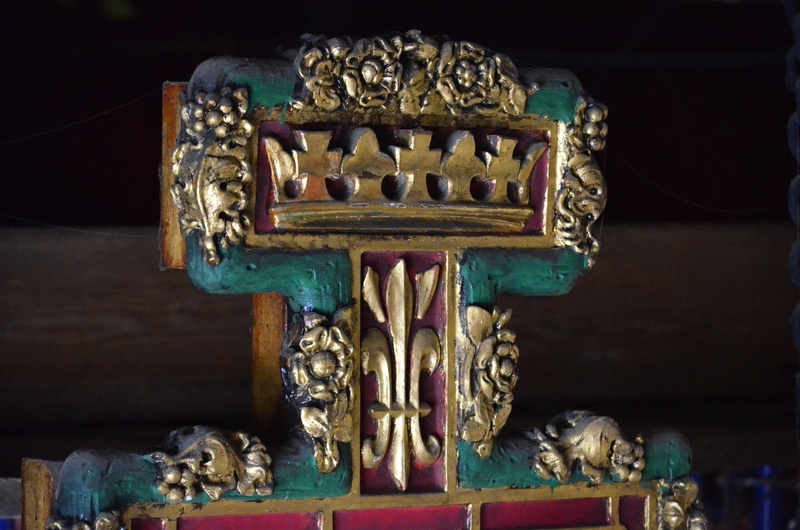 Two close ups of the rood cross. The top photograph is of the crucified Christ wearing his crown of thorns, with an angel attending his left hand. Below is the crown of the reigning Christ with an alternating cross & fleur-de-lis motif. The roses in the Lady Chapel reredos echo the roses found here above and below the crown. 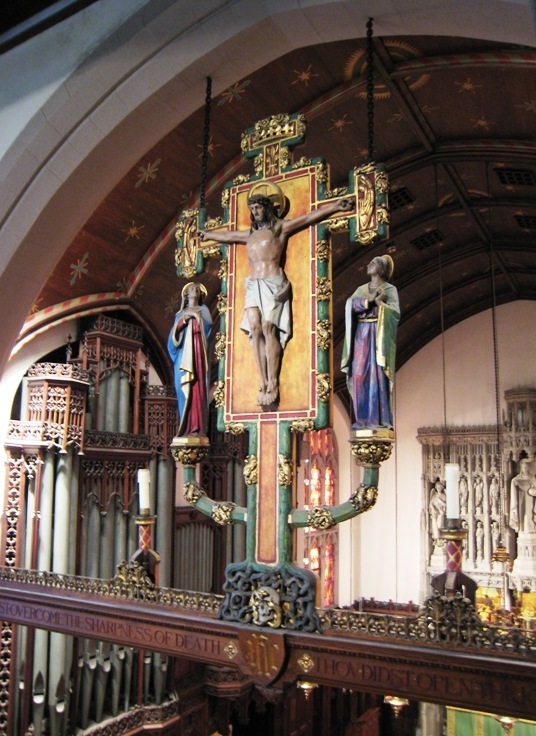 Carved into both sides of the beam, proclaiming to both chancel and nave, is this sentence from the Te Deum: When thou hadst overcome the sharpness of death thou didst open the kingdom of heaven to all believers. 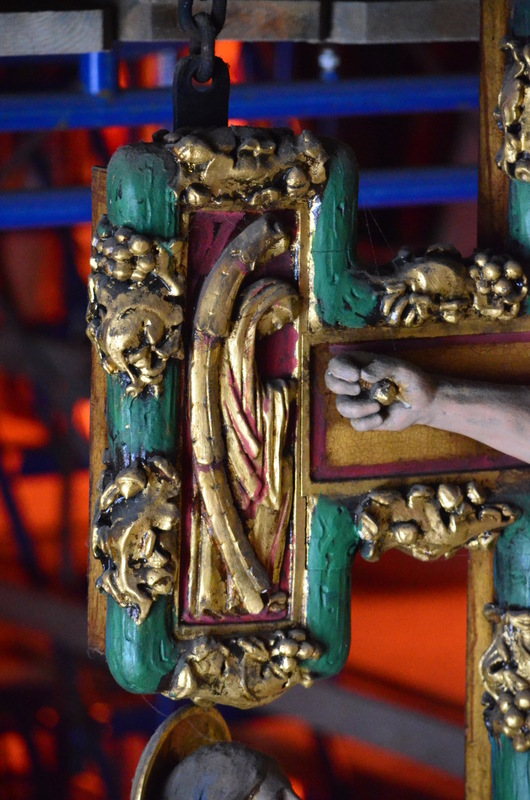 A detail of Christ's nailed right hand, with attending angel. The restored and reinstalled rose-colored clerestory windows in the chancel can be seen amidst the blue of the steel scaffold frames. Click on any picture to see it larger. Adam's skull at the foot of Christ's cross among the roots of the Tree of Life, with a serpent intertwined through its eye sockets. Tucked in beneath all this seriousness are curious faces carved into the wood that supports the entire affair. 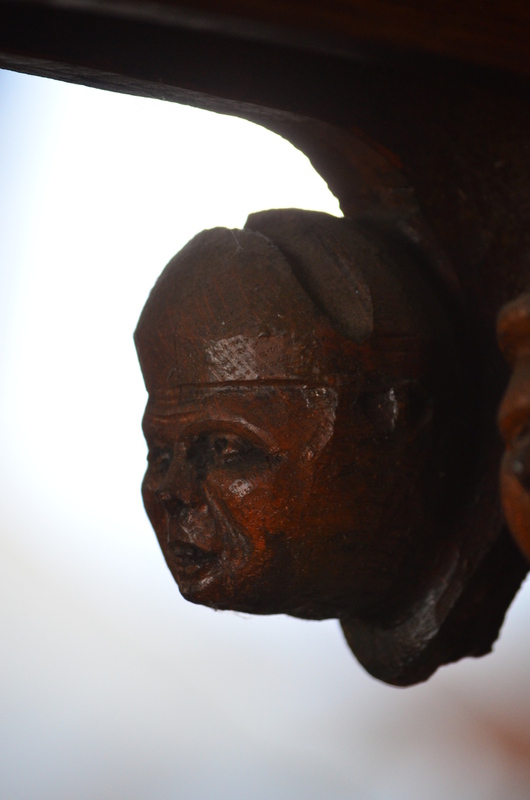 A dim view of a bared-tooth bishop and frowning worker on the liturgically north end of the beam. Four frowning figures are carved, two at the liturgical north end of the beam and two at the south. Judging from their hats and upon first inspection, they appear to be a bishop with a workman and a priest with a beadle. 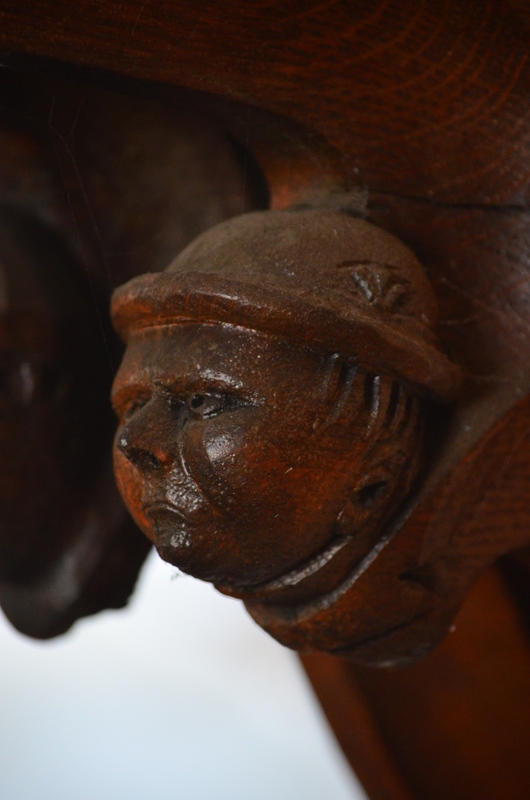 A chubby-faced priest with his ancient, gaunt-faced beadle on the liturgically south end of the beam. None of the figures appears happy, although on the north end, the bishop may be baring his teeth in larcenous expectation. The figure next to the bishop wears a worker's toque, perhaps with a feather in the brim. The bishop's mitre is of the low variety, but plainly shows the deep division in the crown between front and back. Both the figures on the south end of the beam are frowning, buth only one wears a hat. It appears it could be the biretta of a priest. The figure next to the priest has a bald, uncovered head. Under his exaggerated eyebrows he appears to be looking up, appealing to heaven. Black and green with pollution staining and biologic growth, the grotesques at the narthex into the tower were last featured shortly after the steps were demolished to make way for an ADA-compliant entrance. See the story and photographs here. 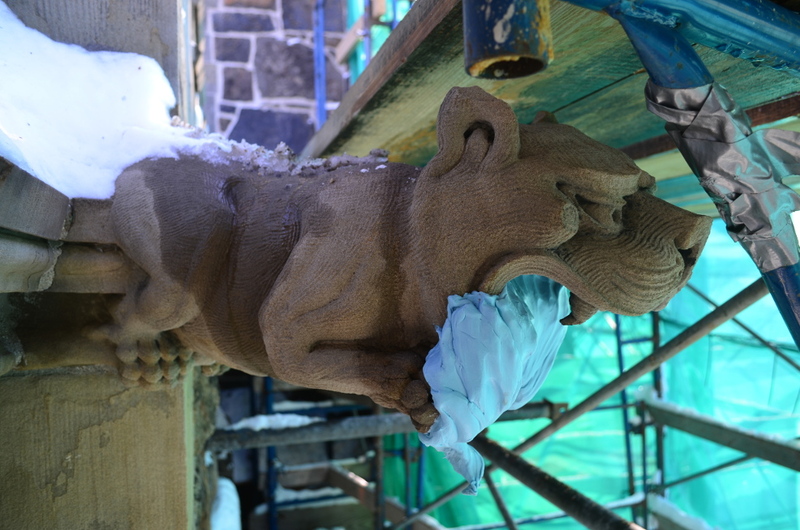 Pictured here amidst the scaffolding in mid-December, our two grotesques have been cleaned. The one on the left is covered in snow and ice from a recent storm. The one on the right is being fitted for a new jaw. Click on the photos to see them larger. 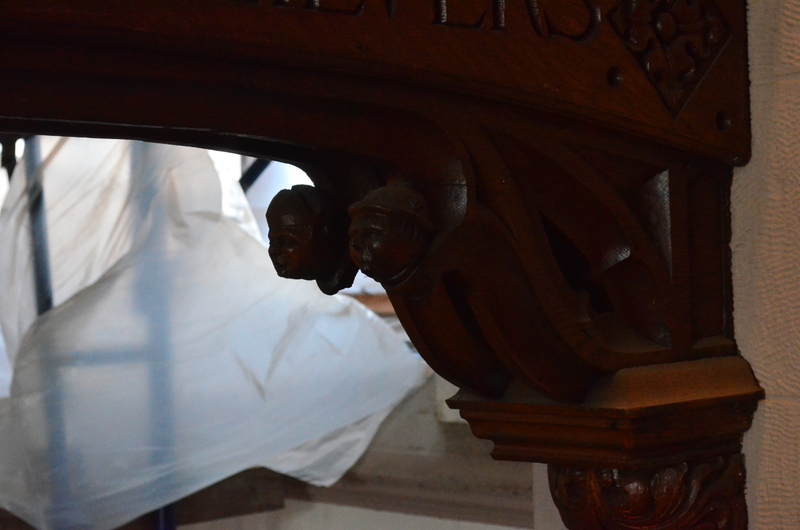 Gently scrubbed cleaned of pollution and organic growth, the All Saints' grotesques are photographed through the scaffolding. See here for their appearance before being washed. 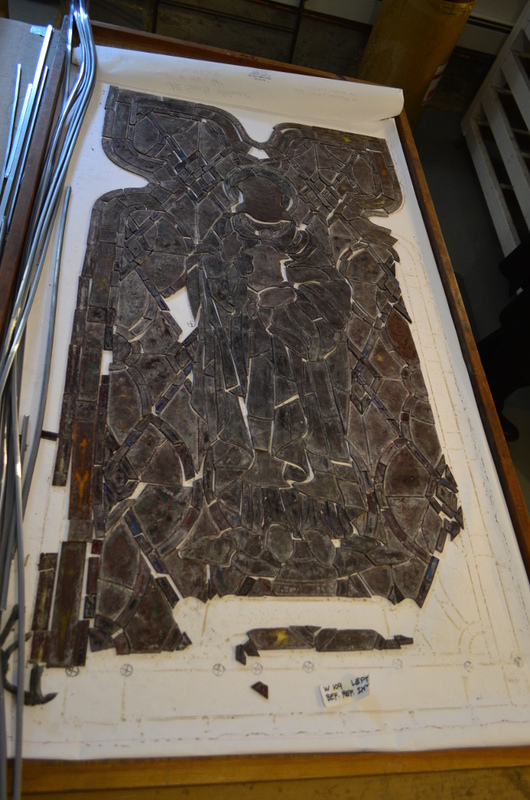 The Lyn Hovey Studio has recently begun working on the All Saints' figural glass. Up to now they have been concentrating on removing glazing from the windows in the church and in installing the new exterior protective glazing. 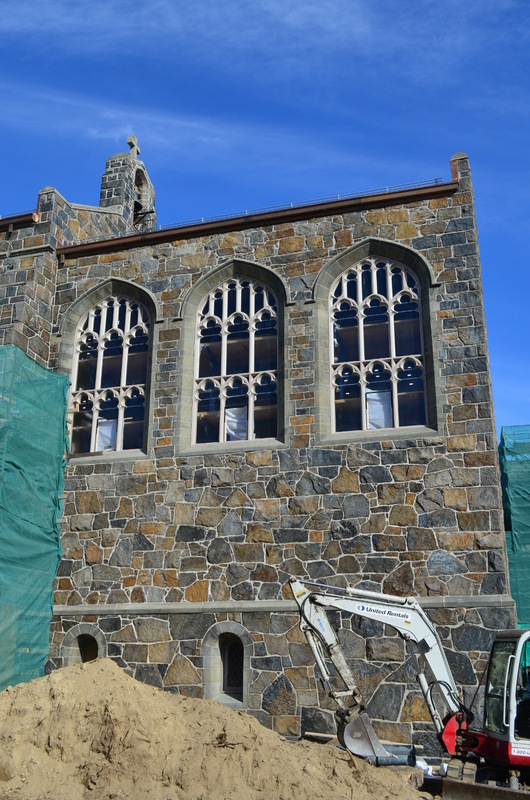 They have also restored the glazing for the Great West Window over the narthex into the bell tower on Ashmont Street. 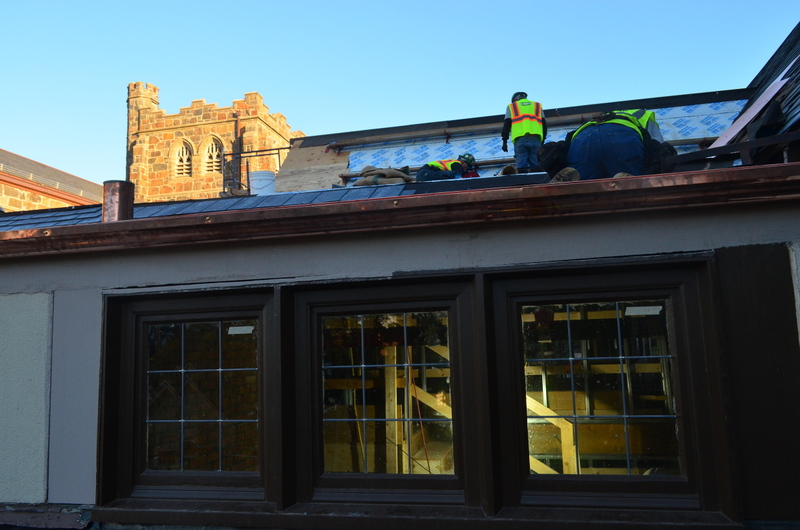 This past week members of the Building Committee made another of their periodic tours of the work on the windows. Lyn Hovey made an invitation to see the very beginning work of reassembling the first of the figural windows at Ashmont. 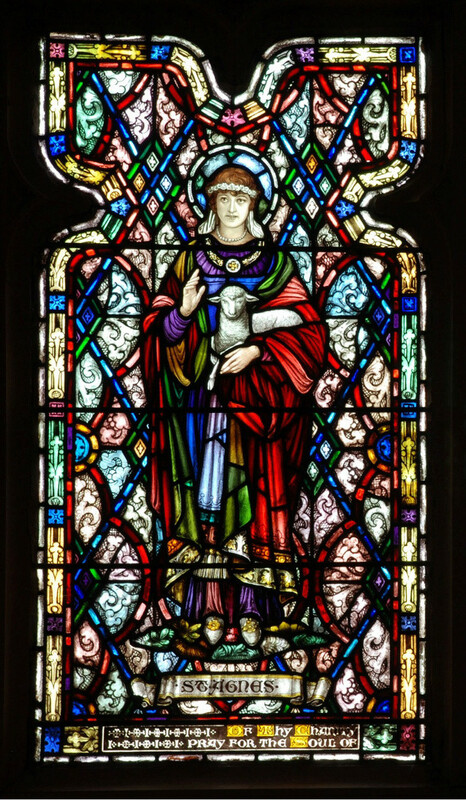 The St. Agnes window is set in a wooden frame in the geographically west aisle adjacent to St. Stephen's Chapel together with a window depicting St. Anne. 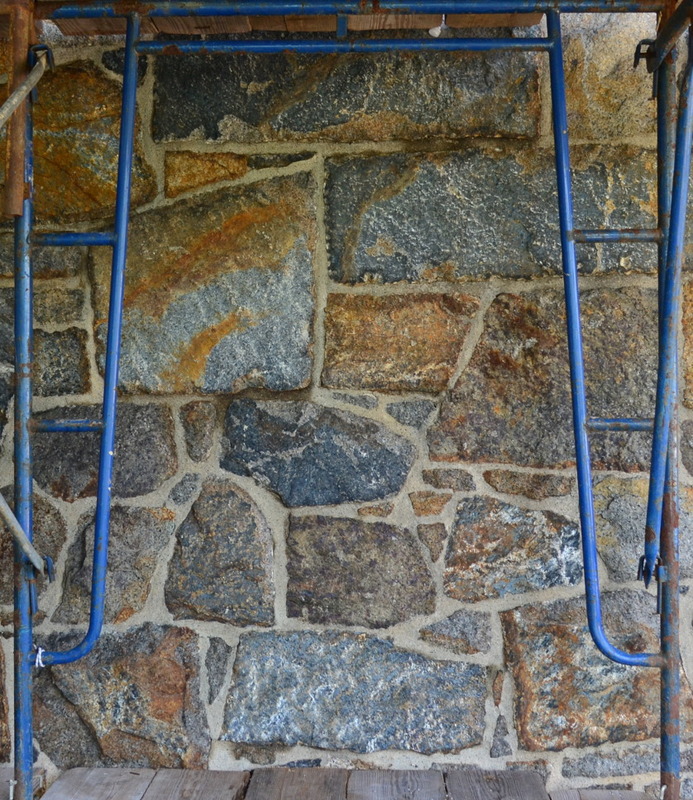 This opening in the granite wall of the church is called window W109 on the architects' plans. The St. Agnes/St. Anne window was designed by the artist Herbert H. Davis and executed by the Vaughn & O'Neill, installed in 1920. 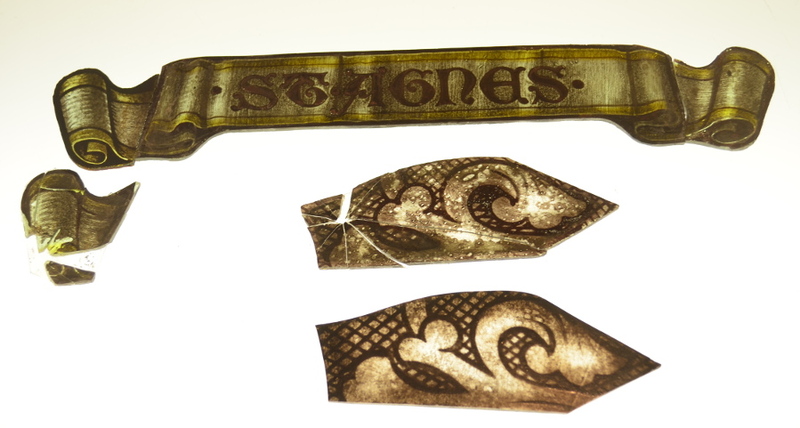 St. Agnes window title scroll with original and replacement glass displayed on a light table. The accompanying photographs depict part of the work necessary to restore and reinstall W109. The window was removed from its frame earlier this past summer. Photographs were taken to document the condition of the window using both transmitted and reflected light. Rubbings were taken to document the location of the lead cames holding the glass in place. Then the window was 'unzipped', that is, the old lead cames were removed and the individual glass pieces placed in a tray on top of one of the rubbings (see the last photograph in this sequence). At this time each piece is examined and those needing mending or replacement are identified. The glass pieces are taken individually and washed of dirt in a gentle surfactant and the edges scraped of lead and solder. 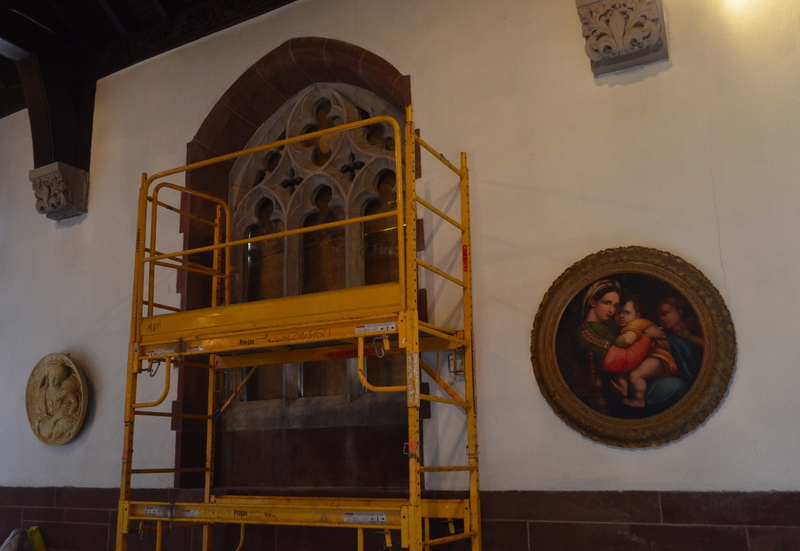 The St. Agnes window is being releaded on top of the rubbing taken before the window's original leading was removed. The title scroll shown in the nearby photo will be releaded into place here, but the fragmented left end of the scroll will be replaced with the newly painted piece. The center of this photograph shows where the newly painted glass will replace the badly damaged original glass shown on the light table in the nearby photograph. The photographs in this sequence show two pieces of glass too fragmented to be reused. They have been photographed on a light table together with the replacement pieces that have been painted to match the original. One piece is a curled part of the left end of the title scroll. The other piece is a oblong decorative stenciled piece. With the newly stenciled piece in place, the craftsman is about to position a small bit of leading adjacent to the new piece. 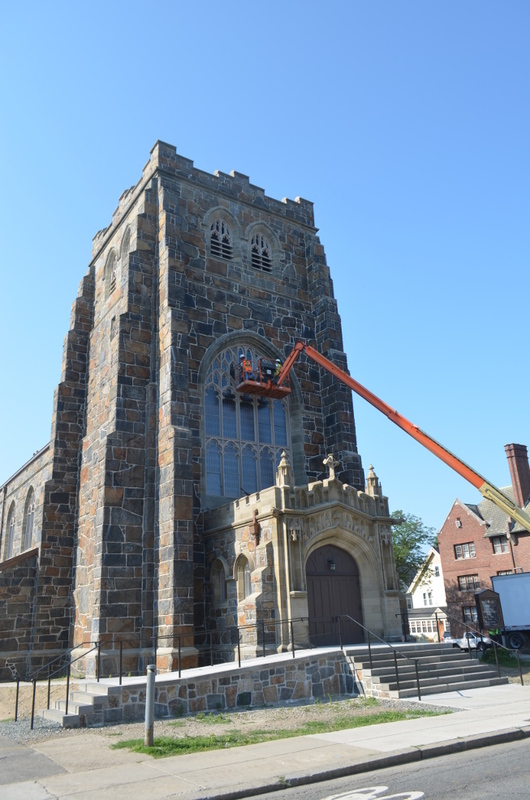 The St. Agnes window is being releaded from bottom to top. 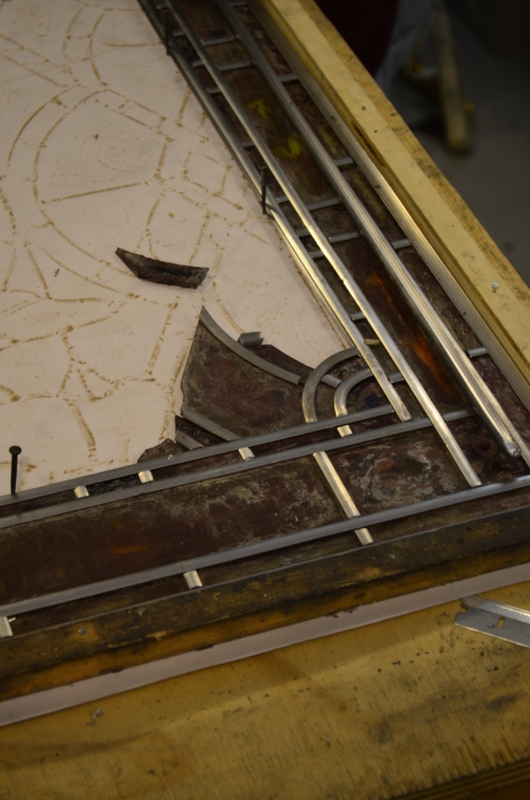 In the accompanying photographs you can see the bottom corner of the tray into which the window will be reassembled, showing the craftsman putting into place glass and lead came. The last photograph shows the tray of unzipped glass which will be moved and set into cames, piece by piece, into the tray of the newly reassembled window after which the cames will be soldered. Positioning a small bit of glass between two lead cames. The newly painted replacement glass is seen just below the craftsman's fingers. 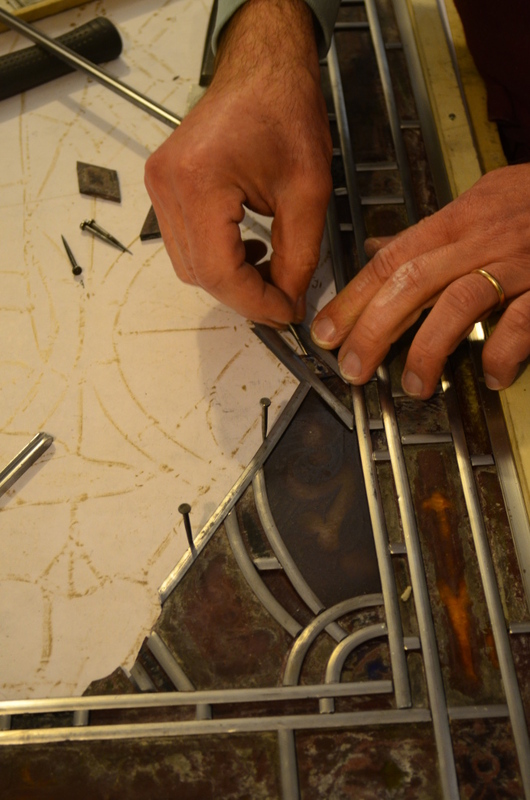 The bulk of the St. Agnes window rests on a rubbing as the craftsman steadily moves original glass from here into new lead cames in an adjacent tray. All Saints' chancel on the afternoon of 5 November 2013. Notice the site work in the foreground for the new electrical service. At the roof line, see the new gleaming gutters and three-rail snow fence. With the work on the exterior of the chancel mostly complete the scaffolding at the west facade begins to come down. This scaffolding surrounding the chancel has enabled work to be performed on the masonry, the clerestory window tracery, the roof, gutters, and the bell-cote. All Saints' west facade on a rainy day in June 2013. Notice the green biological growth close to the ground to the right of the two small arched windows. The high roof of the nave and chancel has been completely replaced as have all of the gutters and flashing. The masonry has been washed, the mortar chiseled and repointed, the Nova Scotia stone string course and window surrounds cleaned. 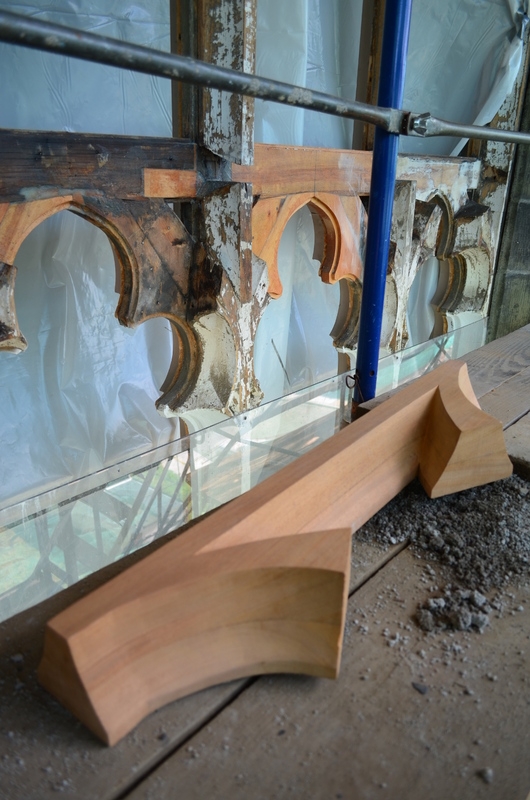 The window frames of the clerestory have been fully restored and protective glazing for the diamond quarry cathedral glass windows has been set into the frames. All Saints' chancel on the afternoon of 6 November 2013. The staging is completely down from the west chancel. See the interior staging behind the protective glazing. The rose-colored diamond quarry glazing has yet to be installed. The white plastic at the bottom of the center lancets is where hopper windows for ventilation will be installed. All Saints' bell tower on the afternoon of 21 October 2013 as the scaffolding was being removed. Click on any picture to see it larger. 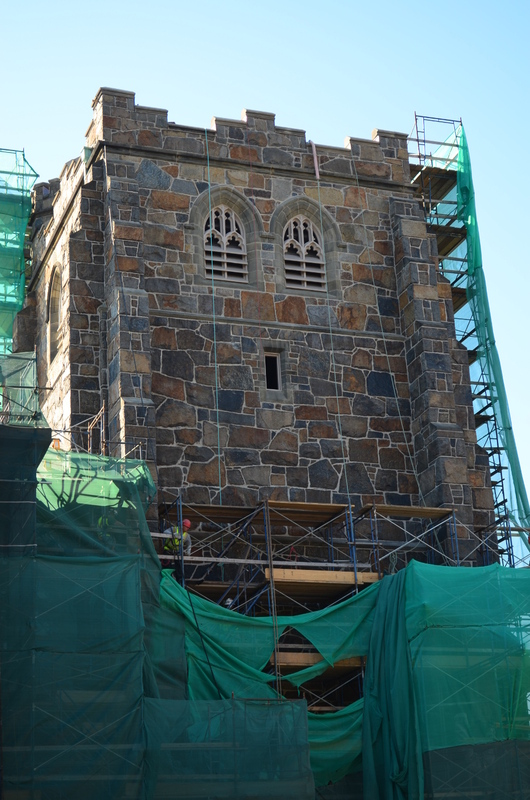 The scaffolding at the east facade of the bell tower now begins to come down. 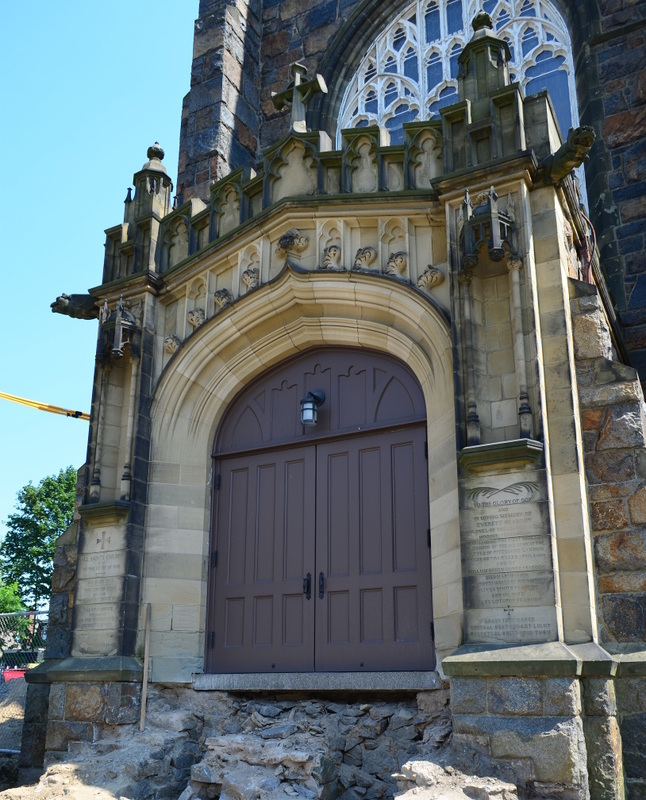 With the masonry and window restoration work almost complete, this section of the scaffolding is being removed to allow the second and final portion of the accessible ramp into the narthex of the church to be poured and the area around it graded. All Saints' bell tower in June 2013 after the site had been prepared, but before scaffolding had been erected. Almost all the masonry of the church has been washed, the mortar raked out, new mortar laid in, and the masonry washed again. 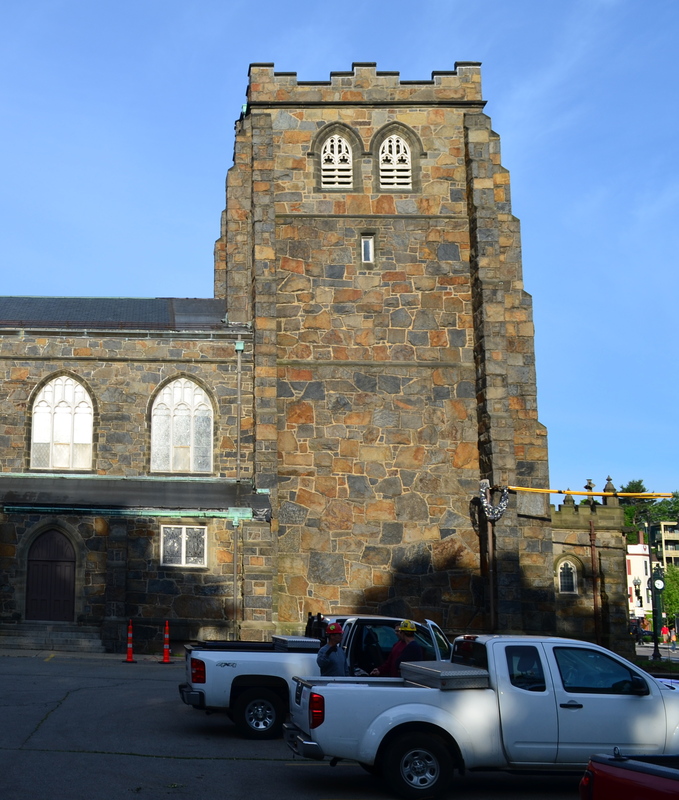 The Nova Scotia stone window surrounds have been gently cleaned. 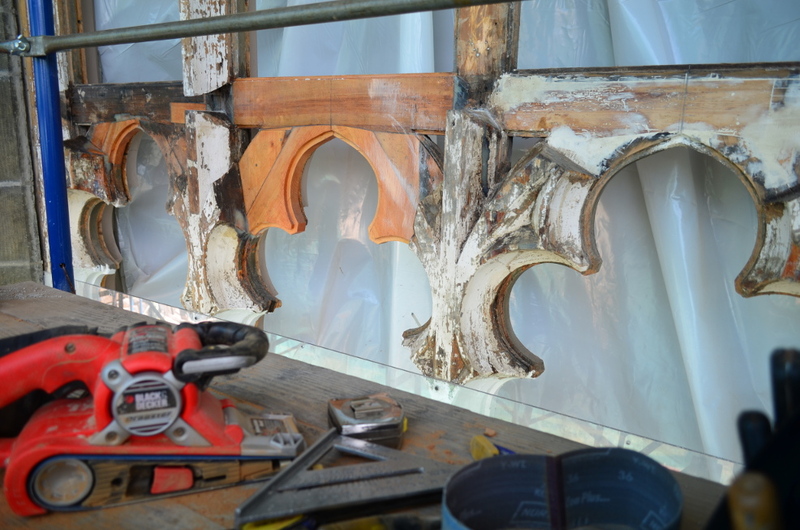 The window tracery in the bell chamber of the tower has received its final coat of paint. As this work is completed at other locations around the church, more scaffolding will come down, until by cold weather the entire exterior of the building will become visible once more. All Saints' bell tower on a sunnier day in June. Notice the temporary rubber roofing on the nave high roof and on the low aisle roof. The Peabody Square clock is just visible at the extreme right edge. Faces at Ashmont: Gargoyle or Grotesque? The church building at All Saints' Ashmont has two gargoyles standing watch, flanking the main entrance at the tower on Ashmont Street. All Saints' narthex on Ashmont Street after the demolition of the original steps. Look for a gargoyle against the blue sky just above the yellow-sheathed electric cables. Properly speaking, a gargoyle provides practical service. 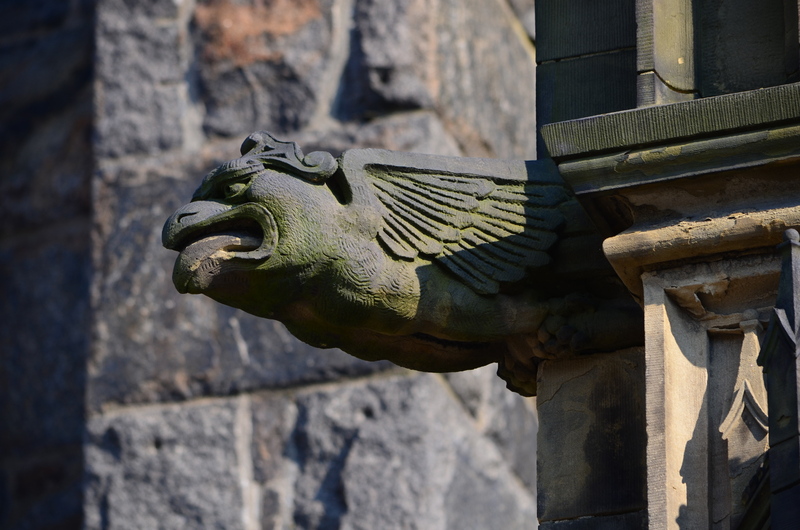 A gargoyle's throat functions as a water spout, collecting rainwater from the gutters of the roofs of a stone building. The mouth is positioned away from the building's walls so the water falls harmlessly to the ground. In this way the water does not wash down the surface of the wall eroding the mortar over time. When they are purely decorative these fantastical forms are called grotesques or chimeras. Ashmont's two gargoyles do not serve this function of diverting rainwater, not having open throats connected to gutters. 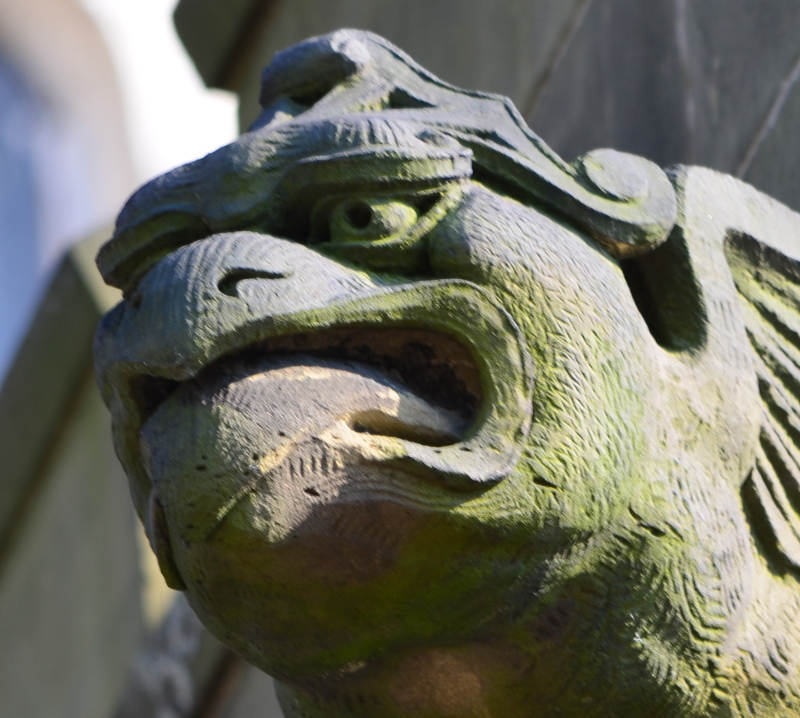 But, let's call them gargoyles anyway, rather than grotesques or chimeras. In medieval times gargoyles were thought to frighten evil spirits away from a church or holy place. Their function in Cram's Gothic Revival church, built in the late 19th century, is less certain. Perhaps post-moderns are embarrassed by the primitive idea of demons and of the need to ward them off. 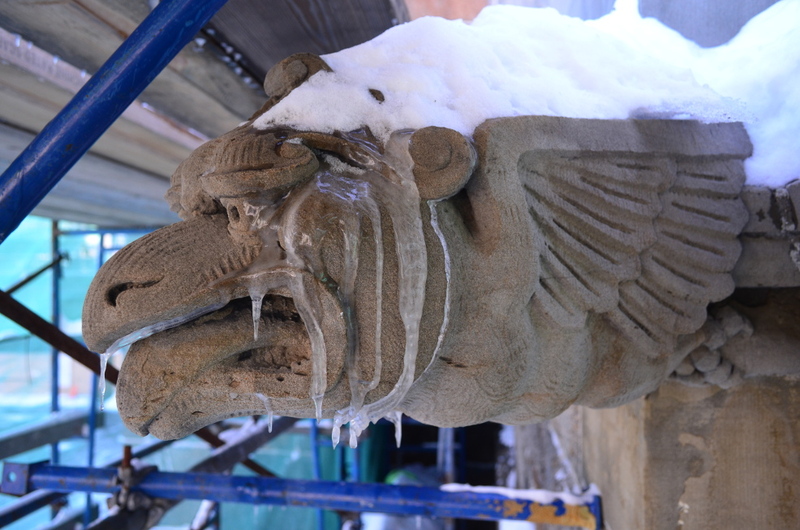 Apotropaic or not, the two fantastical animals guarding the Ashmont Street narthex will be cleaned of their black pollution, green algae, and lichen during the exterior phase of the building restoration. 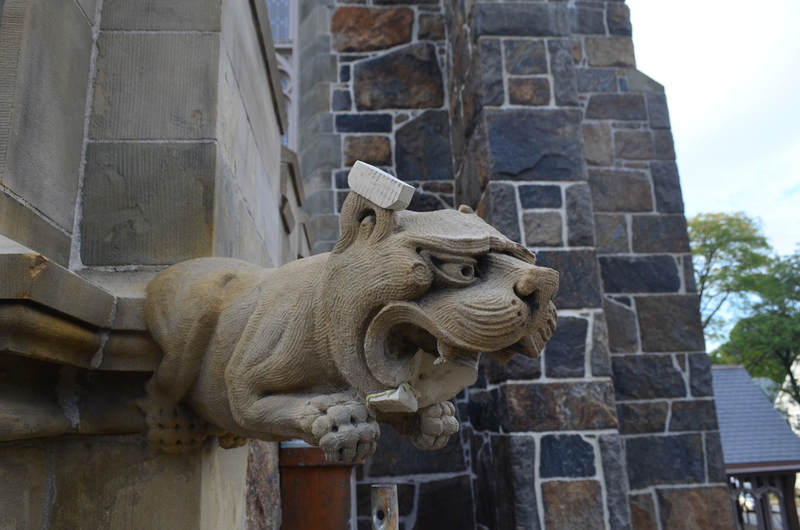 The gargoyle on the northwest corner of the narthex has lost its lower jaw and the top of its right ear. Both of these body parts will be replaced with dutchman repairs. 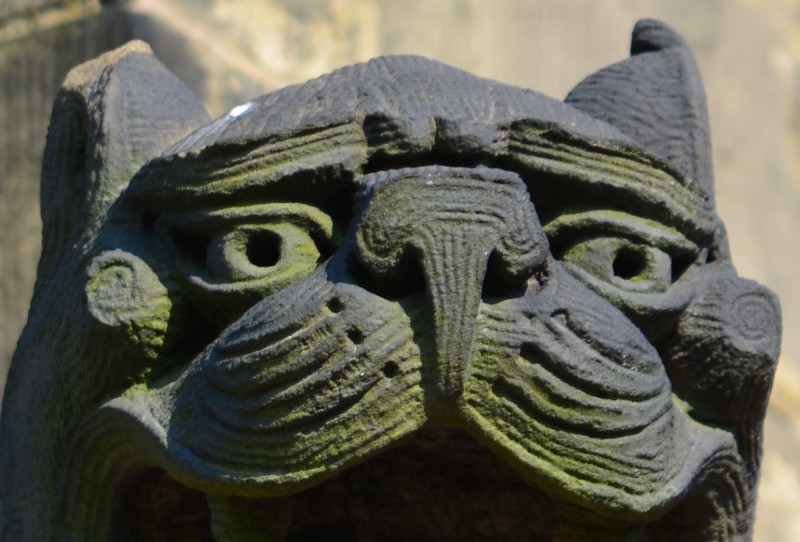 These two stone guardians are not the only bit of medieval whimsy in the architecture at All Saints'. Check here for some photographs of mocking heads—this time in wood—which are barely visible, but slyly added, to a most solemn depiction of the crucifixion. Also see here for more pictures of these figures. Ralph Adams Cram, the architect of All Saints' seemed to want it both ways. In an article in the The Churchman (quoted below) he states that "smoothly-dressed sandstone or limestone is the historic material, and beyond question the most beautiful," but he finds the material too costly both in the material itself as well as in the labor "its refinement demands [in] richness of detail." Yet, in his Churchbuilding, written the same year, he unequivocally states, "What is called 'seam-faced' granite is the very best material where it can be obtained" (25, 3rd ed). Scaffolding frames a portion of the south wall of the cloister in a subdued afternoon light. Click on any picture to enlarge it. 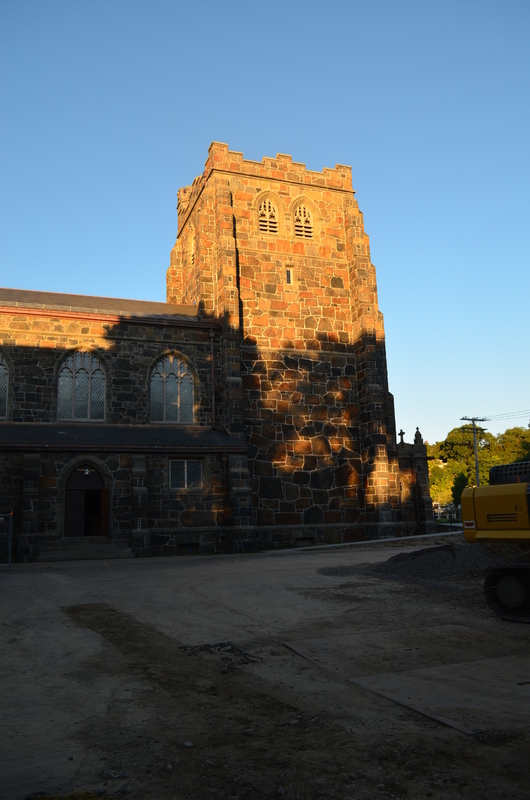 Fortunately for the congregation of 1892, seam-face granite was a very local material, being plentiful in the quarries of neighboring Quincy. It was thus both beautiful and economical. 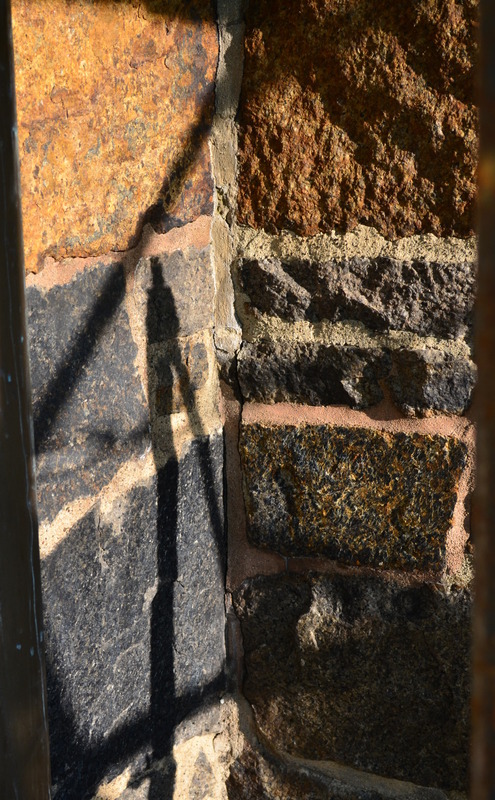 An interior corner of a tower buttress in a harsh late afternoon sun. Look at the mortar to see the evidence of various repointing campaigns. The variety–in block size, color, and pattern–of the stone used at All Saints' is enchanting whatever the light, whatever the weather. 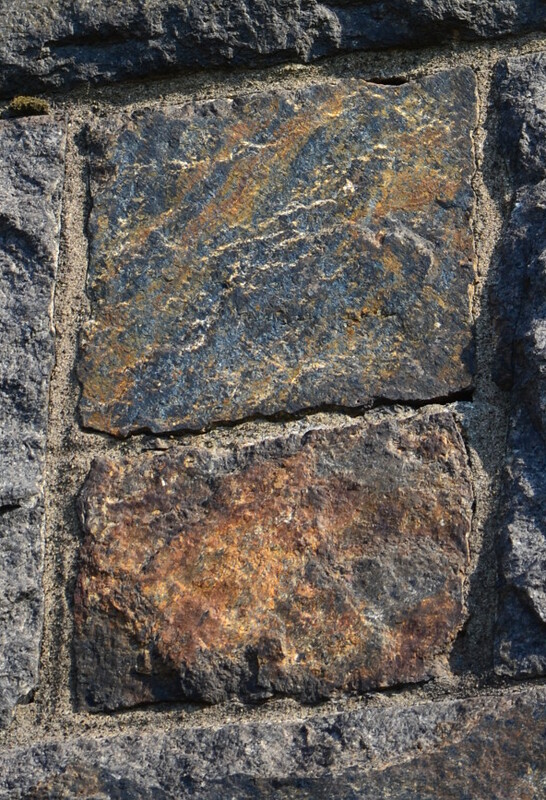 In the early morning or late evening, the slanting rays of the sun bring out the sharp ferrous hues of the iron within the stone. In the subdued light of a foggy afternoon, the colors given by the iron have all the subtlety of an impressionist painting. "[A] stone was discovered that certainly, so far as the East is concerned, is the most perfect building material at a reasonable price that can be used for church work. 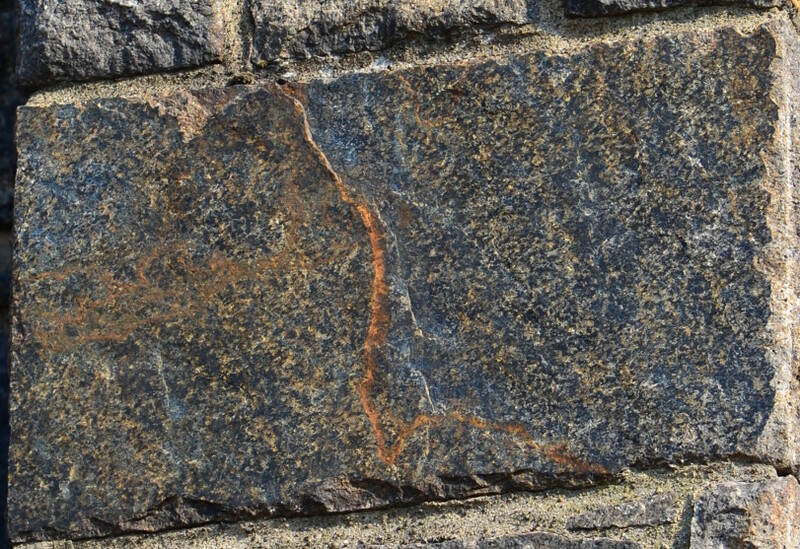 This is the so-called "seam-face" granite, that may be obtained in blocks of any size with a practically smooth surface and with a wealth of tone and color that is matchless. By its use one is able to obtain in a year the effect of a century's age, with all that means of dignity and solemnity of effect." —Ralph Adams Cram. "All Saints' Church, Dorchester (Boston), Mass," The Churchman (April 15, 1899), 562. 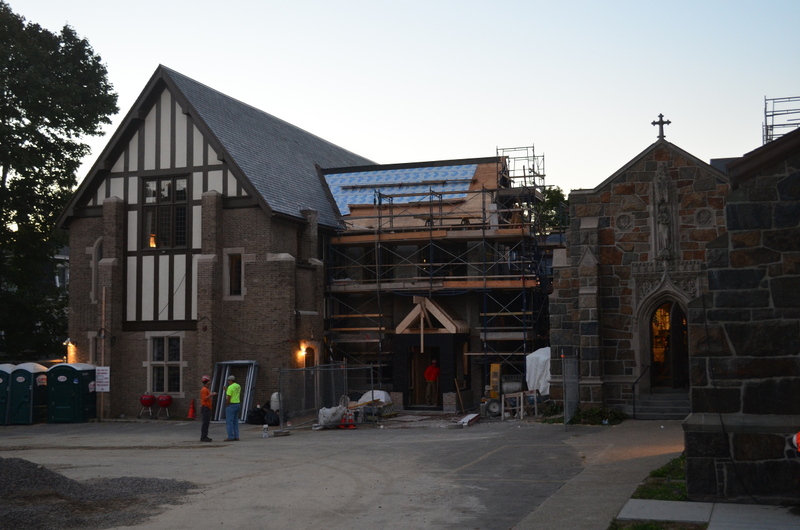 Phase One of the All Saints' building restoration is focused on the exterior of the building. 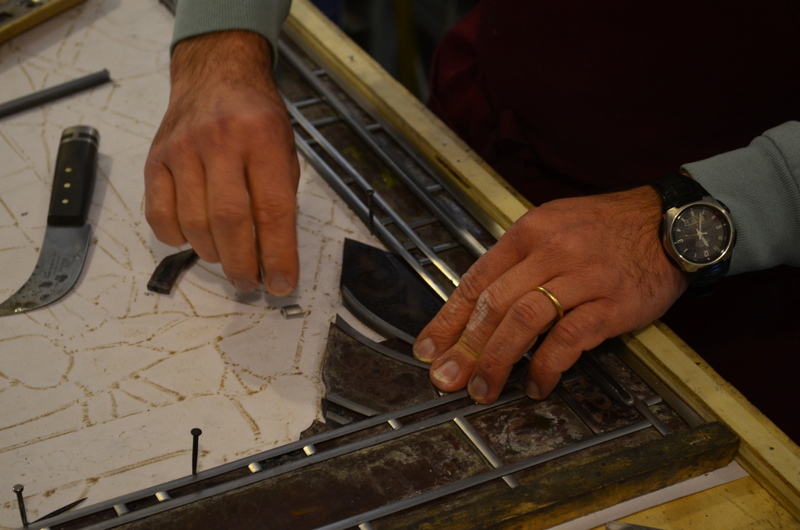 An important part of this work is the repair and restoration of its windows. 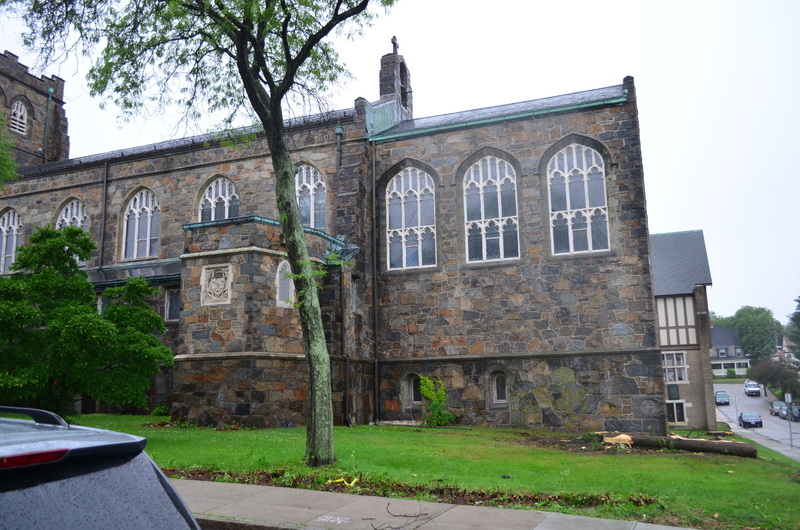 The church and parish house together have 304 sash in 134 windows. Tops of two lancets from chancel clerestory windows. The one on the right shows the work of industrious, nesting birds who eased aside a make-shift sheet metal repair. As grand as All Saints' may appear, it was constructed on a tight budget and compromises were made in order to remain within that budget. One of these compromises was the provision of wooden tracery, instead of stone, for most of the clerestory windows in the church nave and chancel. 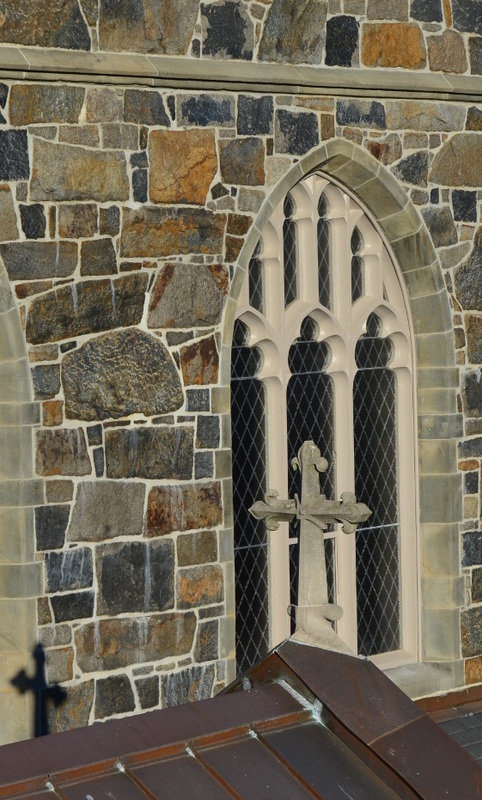 Only three of the four figural windows in the clerestory have stone tracery. The remaining figural window and all the diamond quarry "temporary" windows have frames and tracery of wood. Constructed of white pine one hundred twenty years ago, the tracery of all of the clerestory windows needs repair and that of several of the clerestory windows is in dire need of repair. 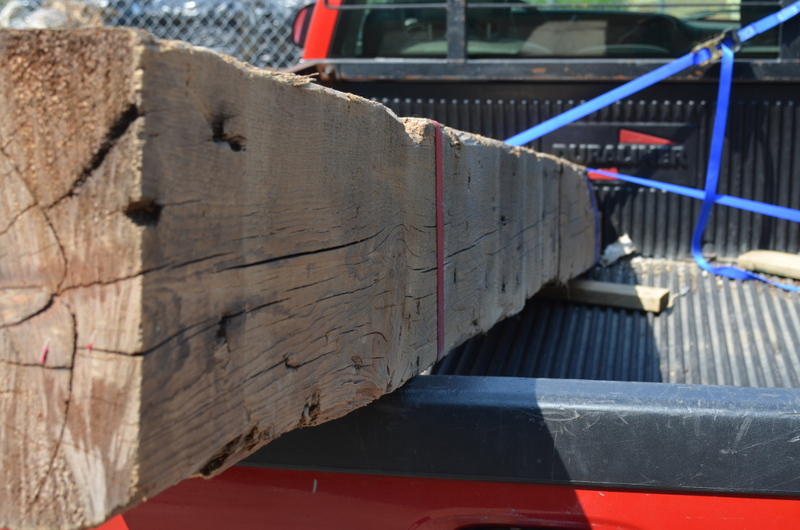 A beam of old growth white pine in a pickup truck bed, just arrived from the supplier. 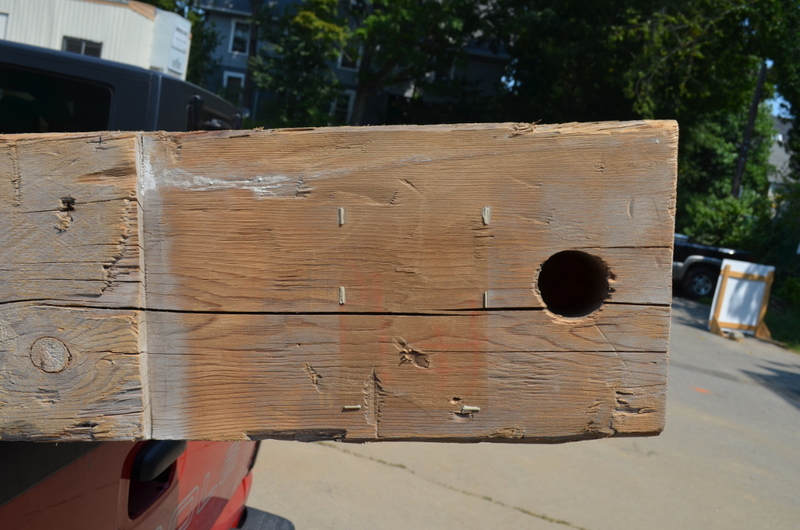 This stock will be used for dutchman repairs. The philosophy for this repair is conservative. 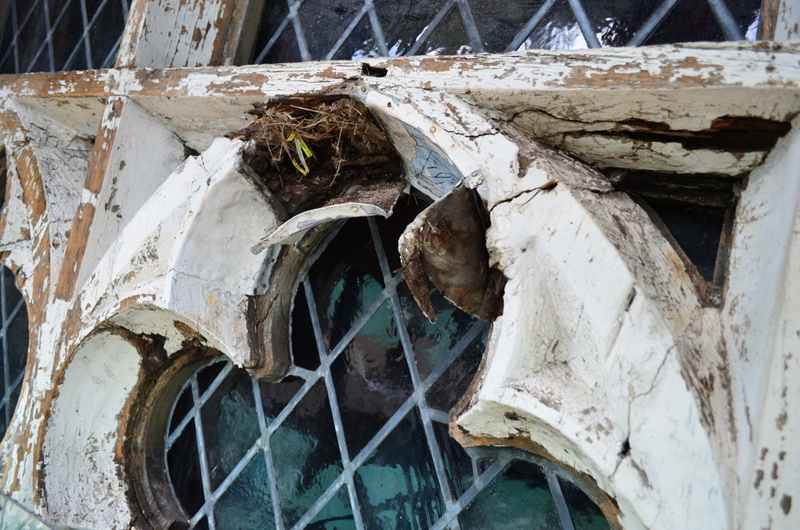 The windows themselves are removed and taken for restoration, the old exterior protective glazing is removed and discarded, and the frames and tracery are scraped and examined to reveal what kind of repair is necessary. Where a dutchman repair is needed (replacement of a portion of a member with new wood) the repair will be made with a like species of wood. Where an entire member needs replacement, Honduran mahogany will be used. In this way the dutchman repair will be made with a wood whose characteristics (e.g., expansion and contraction with weather conditions) match the original construction providing the greatest service life, while the more durable wood will be used for replacement pieces. 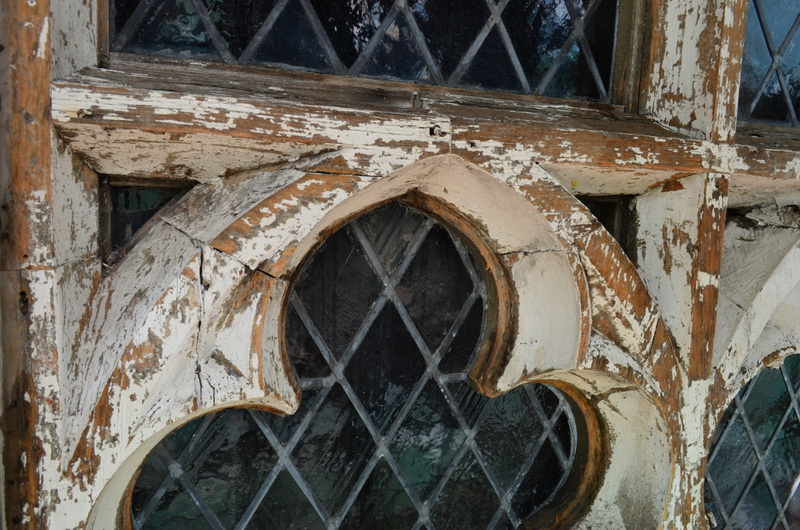 Once the wood repair is made to a window, the repaired frame and tracery will be scraped and painted, and protective glazing will be mounted on the exterior. As they are ready, the restored windows (diamond quarry and figural) will then be re-installed from the inside scaffolding. 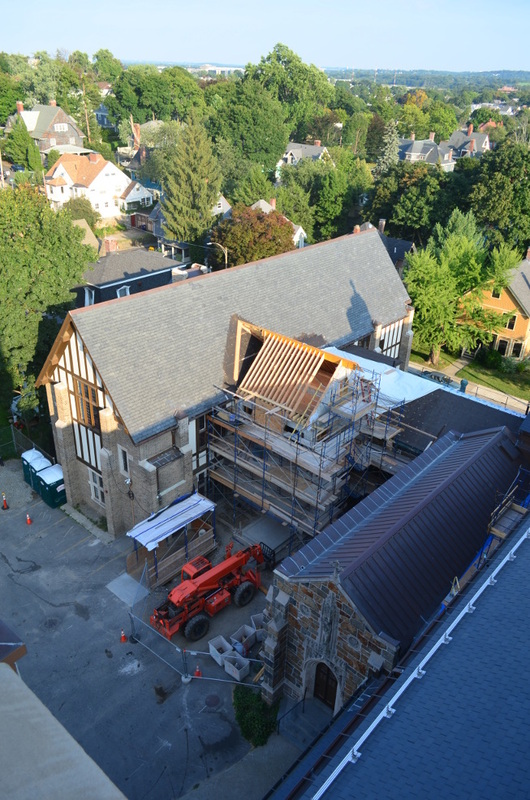 See here for more photos of the All Saints' building restoration. For additional photos of All Saints' see the Brief History and the Brief Guide to the church.